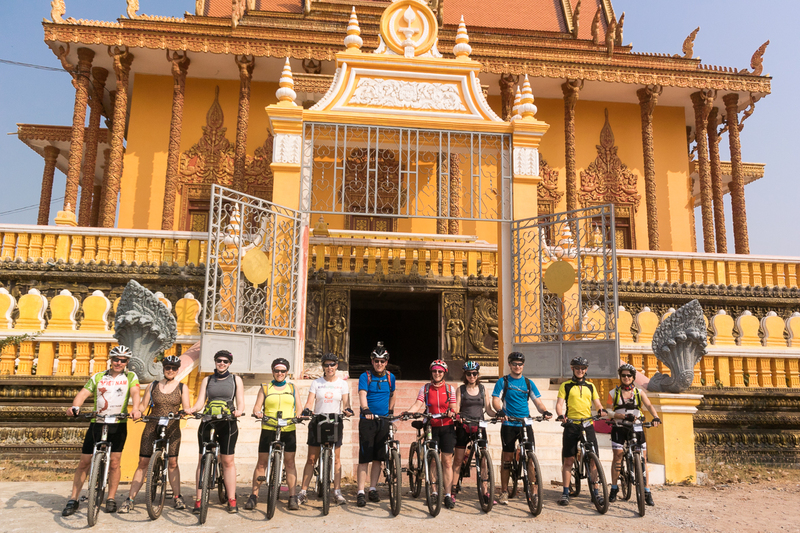 Our last day cycling started with a bus journey to Siem Reap, gateway to the famous temple complex at Angkor Wat. 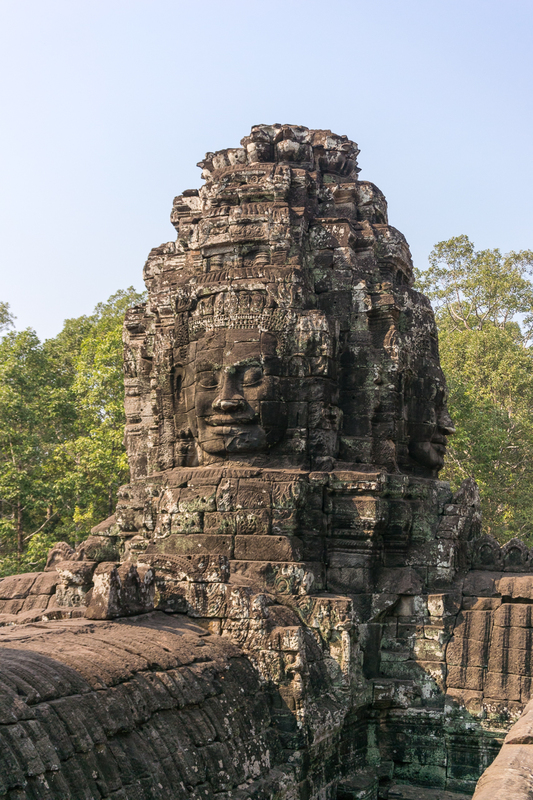 Angkor Wat is a UNESCO world heritage site and its distinctive towers feature on the Cambodian national flag. Surrounded by a wide moat, it was built in the 12th Century and in its time it was the part of the largest city on earth. It is at once familiar and yet unwordly. Its ancient stones and scale a dramatic contrast to the wood and tin buildings we’d seen on our journey so far. As we crossed the causeway, our temple guide explained how the construction represents the Hindu vision of the Universe. The central tower represents Mount Meru, the mythical mountain at the centre of the universe. Its five peaks are represented by the five towers and the ocean that makes up the outer universe is represented by the moat. It felt strange to be walking around among the groups of tourists, after so much time as our own group on the roads. 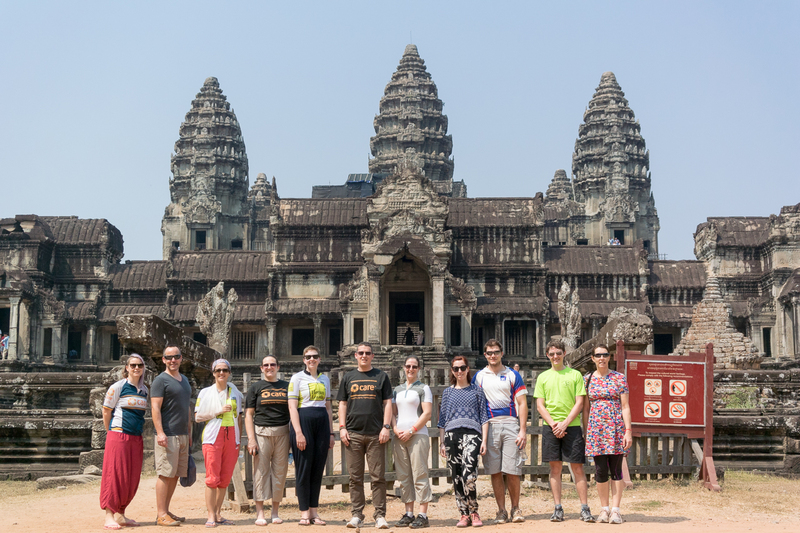 But it was great to be able to explore the stone buildings and admire the beautiful elaborate carvings that adorned the walls and showed scenes of life in ancient Cambodia. 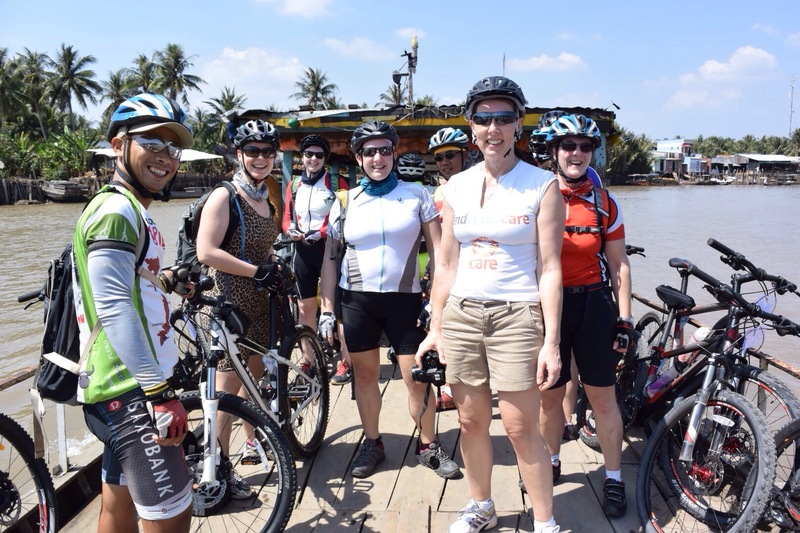 We had lunch in a cafe just behind Angkor Wat and got back on our bikes for a short ride to our next stop, the Bayon temple. This is remarkable for the carved stone faces that look out in all four directions from its many towers. The serene faces smile out over the jungle setting. We had some fun taking group photos in the stone galleries, and our guide had trouble keeping us together. 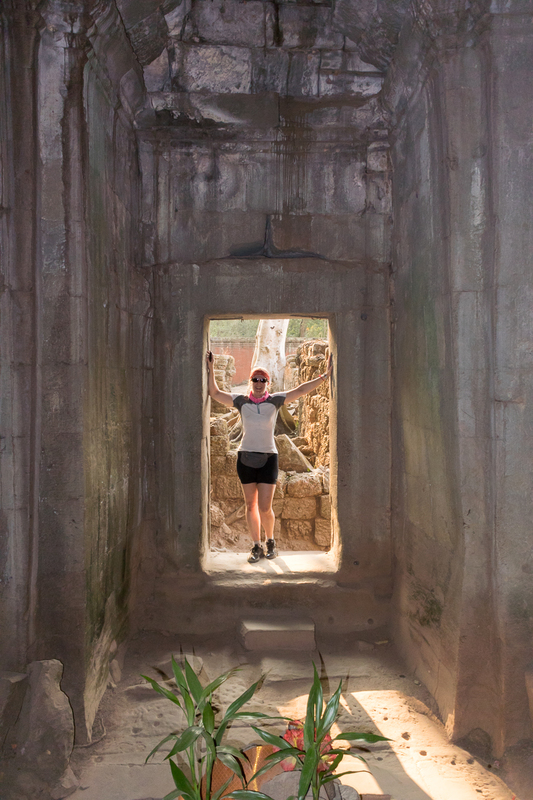 But eventually we all made it back to our bikes for the ride to the last temple of the day, Ta Prohm. The paths on the way there were little more than tracks in the sandy ground and there were moments when we felt the wheels sliding beneath us as we made our way through the dense undergrowth. Getting away from the tourists and the minibuses, made it feel like a real adventure, exploring some long forgotten land. Ta Prohm is arguably the most dramatic and photogenic of the three temples we visited. Abandoned centuries ago, the jungle has reclaimed its territory here, and huge trees throw their roots over the stones, like monsters about to crush them in their claws. It looks like a film set. As we entered the outer courtyard, we were reminded of King Louie’s hideout from the Jungle Book. But if you’ve seen the first Tomb Raider movie, you’d definitely recognise it. Our guide told us that Angelina Jolie and the crew spent 8 days filming in this location, starting very early in the morning each day. 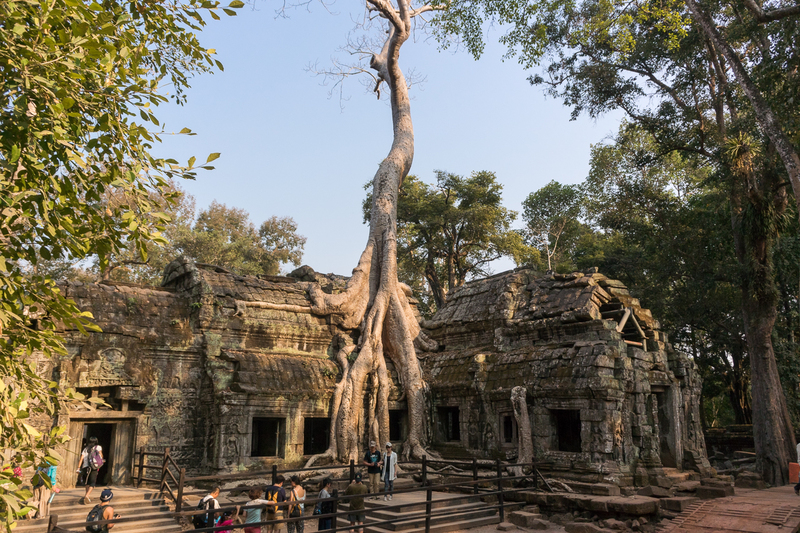 The semi ruined temple, possessed by the twisted roots and branches of the huge trees, make a dramatic backdrop. And for me, its beauty was enhanced because it was both broken and held together by natural forces. In parts there were just heaps of rubble and broken stones, but some sections have been restored, pieced together like a complex jigsaw puzzle. We had a lot of fun peering round corners into shadowy doorways here. It felt like the scene of adventures and stories, and it was hard to keep us moving on. But the afternoon was drawing on and we still had 10 miles to go to finish our epic ride. Once more onto the forest tracks in single file, we passed between a few small dwellings, simple huts woven out of jungle materials. 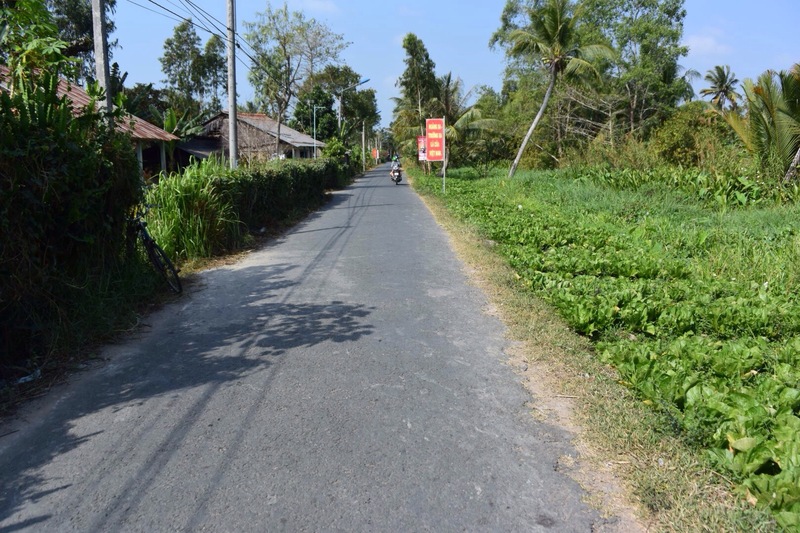 It was quite a dramatic change as we came to the busy main road as we cycled towards the city of Siem Reap. The traffic really was crazy here, with scooters, cars and bicycles travelling three or more abreast. But by now we’d got our confidence and went with the flow, laughing at the craziness and eventually all cruising up to the front of our hotel, all in one piece. And that was the end of our ride. Our bikes were dismantled and packed up onto the truck for the last time. We posed for photos, congratulated each other and Kathryn awarded us with medals for making it to the finish. There was a huge sense of achievement and celebration with a touch of sadness that this amazing experience was about to come to an end. 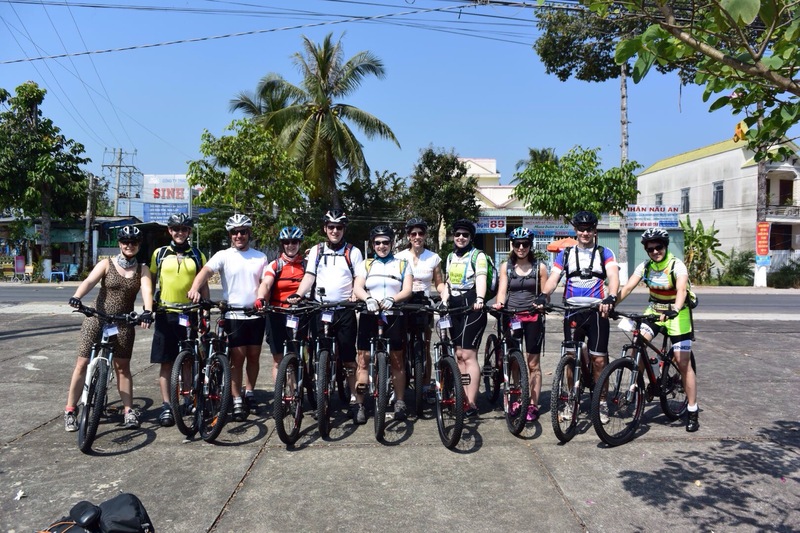 We did it – 2 countries and 460km completed! We made it last a little longer, with a fine celebratory dinner at a local restaurant, where we thanked our guides and drivers, and Kathryn and Tracey summed up an amazing few days. Everyone got a special certificate recognising their unique contribution to the group. Siem Reap really comes alive after dark and our celebrations continued into the night. Drinks on Pub Street; a game of table football beneath a skate ramp on the roof of a bar; and a tuk-tuk ride to a rather dodgy looking karaoke bar. It was another memorable night and a fun way to bring our adventure to an end. You can see in the photo above that I was wearing a GoPro camera on my cycling helmet. The following is a video of the footage I captured during the trip. It was a 7am start and a relief to be cycling in the cool of the morning on our way to the Ton le Sap river, where we saw a family making smoked fish. First they lined them up in neat rows on skewers, then blackened them over a low fire. 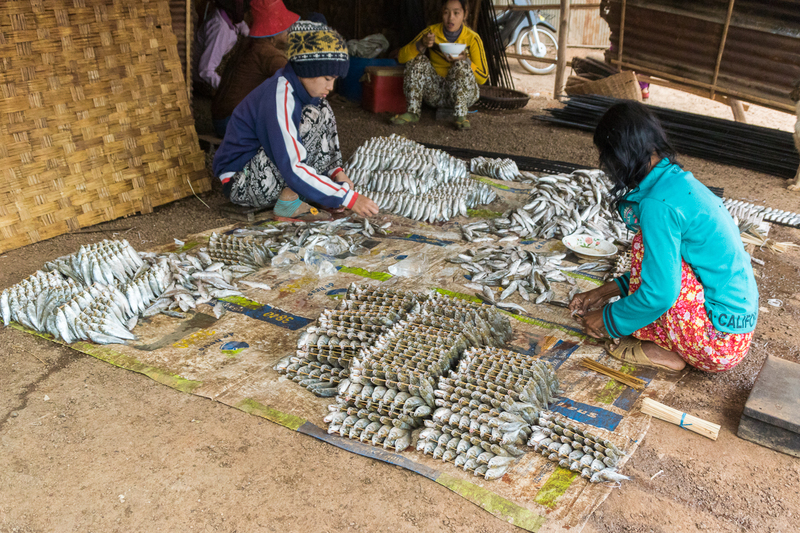 This helps preserve the fish so they keep for up to a year, providing a cheap source of protein. 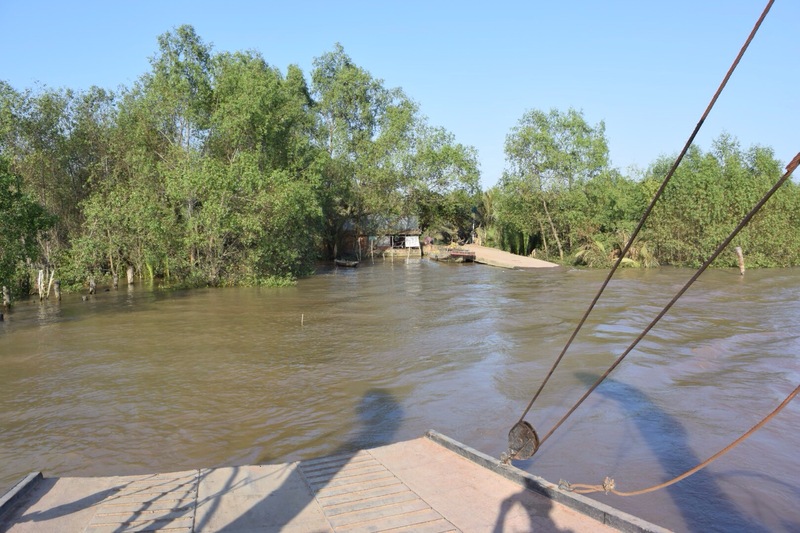 We saw a great many houses on high stilts over the river, showing just how much the wet season floods change the characteristics of this area. 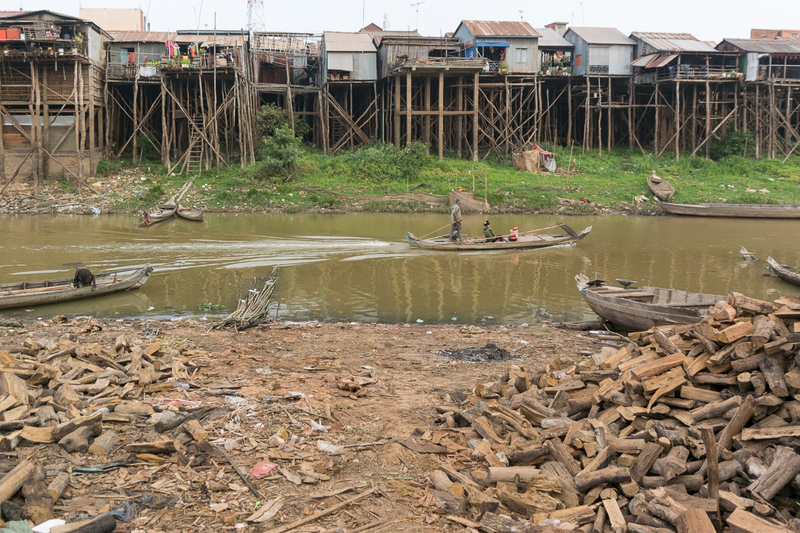 Less than a mile further on, we saw a floating village, where an itinerant community of Vietnamese people live in houses on the river itself. Then it was back on bikes for another stretch which included a deceptive long shallow climb, followed by a glorious coasting descent. This area is famous for its pottery and the local people go to collect clay from the nearby mountain to make cooking and storage pots. We saw a great number of these beside the road, drying in the sun as we got to our next stop, where we watched a potter at work. Rather than use a potters’ wheel, this was real back to basics stuff, as the lady demonstrated how she transformed a long tube of clay into a rounded pot by walking round and round it, and shaping it with her hands. You could see a groove in the dirt, where she’d ground out a path. Laura and I gave it a try. We weren’t sure if the lady was laughing because we looked funny working in our cycling helmets or if it was because she couldn’t believe we were so bad at it. 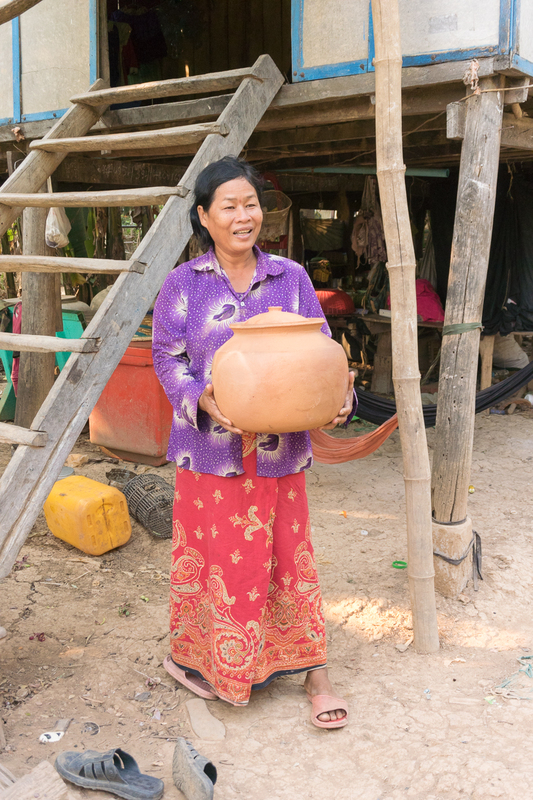 She told us she can make up to ten pots per day, which she sells for 75 cents each. 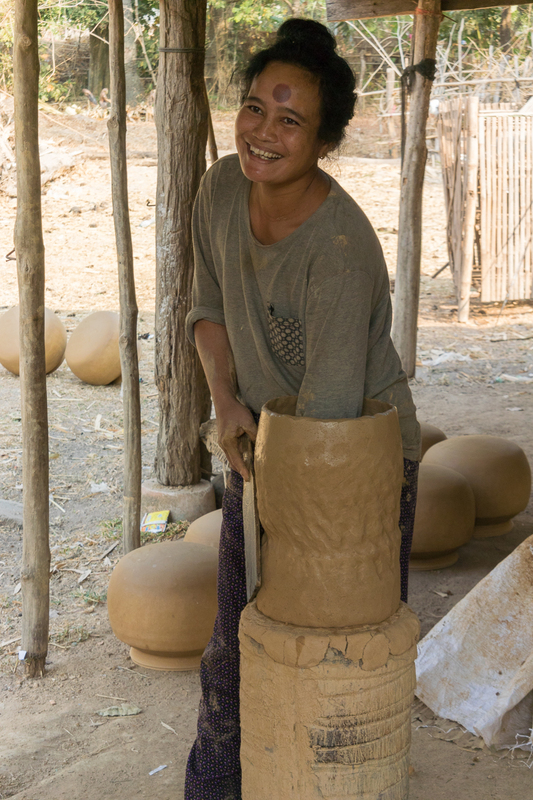 She leaves each pot to dry in the sun for three days before firing it over a fire of rice husks. This has the advantage over wood, as it’s easily available, and provides the right temperature for the pots. We provided ready customers for some of the smaller samples and three large pots which we put on the van to take to our next destination, visiting some of the entrepreneurs supported by Lendwithcare. 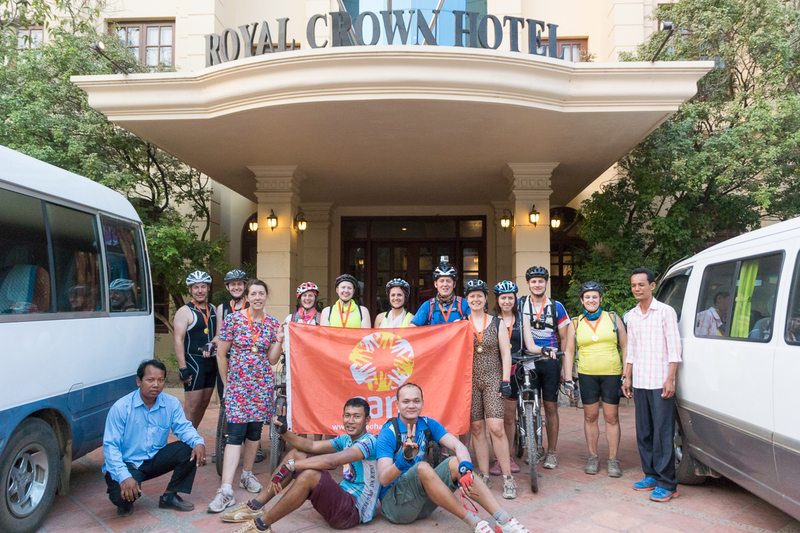 After a morning’s cycling, we were back on the bus for a 3 hour journey to Battambang in the north west of Cambodia. 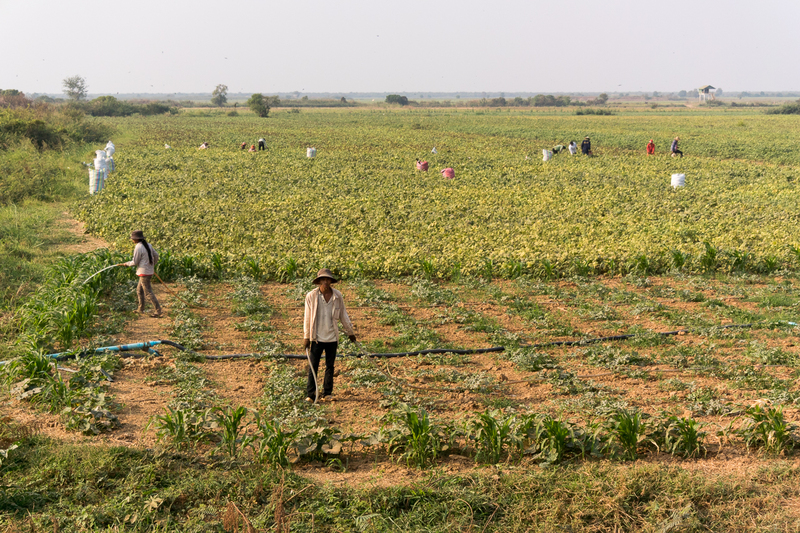 This area is known for its rice production and is still a hub for trade between Phnom Penh and Thailand, which is only a couple of hours away. As we drove through to our lunch stop in a local restaurant, we saw many French colonial style buildings being used as restaurants and hotels. At lunch we met members from CCSF, the local Micro-Finance Institution (MFI) that Lendwithcare partners with in Cambodia. They followed in their truck as we rode the short distance to their office where we learned more about the loans and savings services CCSF offer to the local communities. We already knew that Lendwithcare had rigorous criteria they use in selecting MFI partners, but it was great to hear first-hand the additional benefits that CCSF provided to communities over and above the loans themselves. All members were encouraged to save with an attractive rate of interest and the opportunity to win a large payout each month (this reminded me of Premium Bonds model here in the UK). Loans also came with a built-in life insurance policy that not only cleared the loan should a member pass away but also covered funeral costs, to avoid a burden being placed on a spouse or children. Outside the office we got back on our bikes for a short ride to a nearby village where we met three entrepreneurs who benefit from the loans and savings schemes. The first lady we met, Mrs Savan Tob, was delighted with her gift of a cooking pot and told us about her business growing beans. She told us that last year, she’d grown watermelons, but that she’d lost a lot of her crops due to heavy rains. And in fact, her house had flooded. 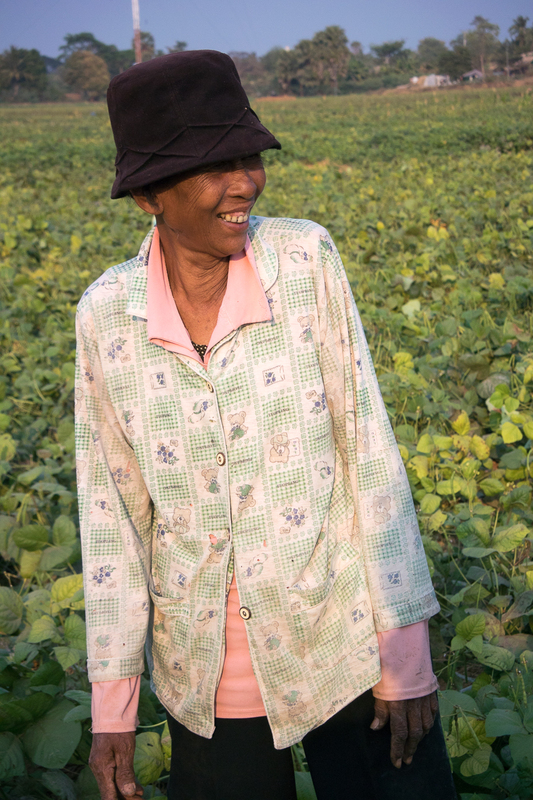 This year, she felt the soil wasn’t so good for watermelons, so she was just growing beans. It was a potent reminder about the effects of climate change at a very personal level. She’d used the loan to buy seeds and equipment, and will rent equipment and hire people to help at harvest time. We left the riverside in search of another entrepreneur. I didn’t realise at the time, but this was Chenda Yoeurng who was the third entrepreneur I loaned to, back in November 2013, long before we knew about this trip. 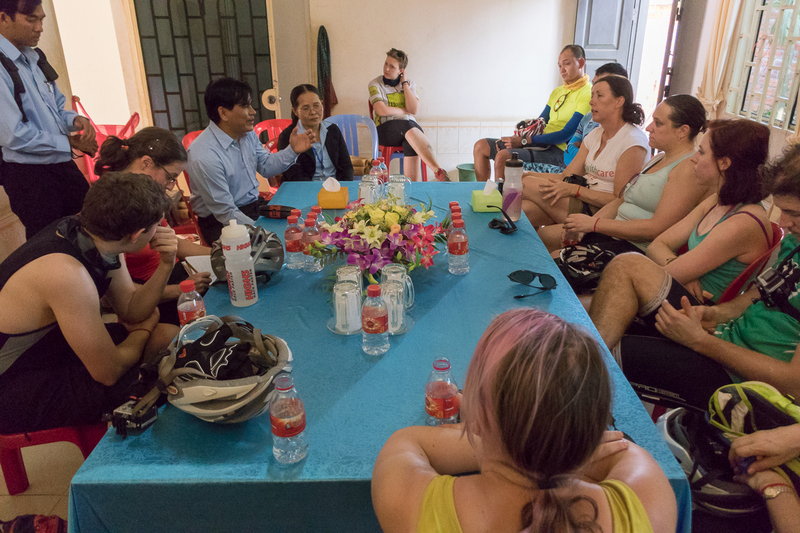 Chenda was a bit shy, which isn’t surprising given that a group of strangers dressed in cycle gear had suddenly appeared unannounced on his doorstep, and so he directed us to talk to his mother who was working in the field across the road. 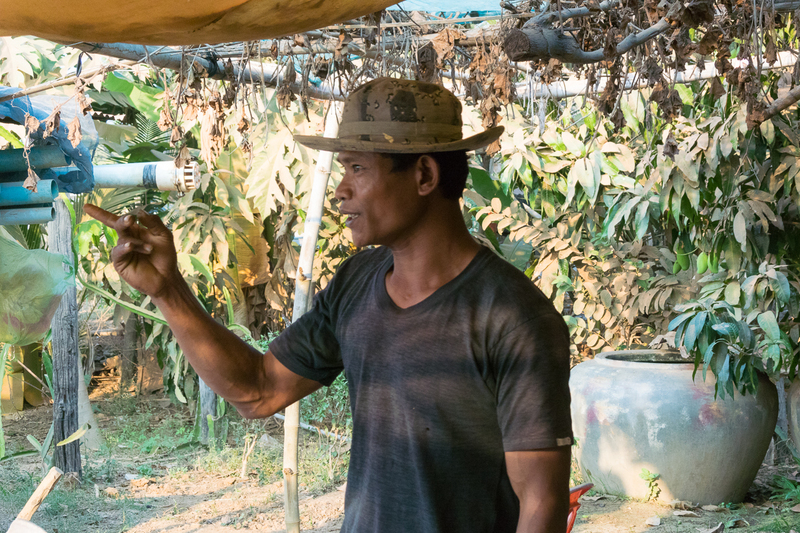 As we walked along the edge of the crops, we saw large sacks of soya beans that had already been harvested, with people crouching down to pick more from the the rows of plants. Chenda’s mother saw us approaching and recognising the gentlemen from CCSF came over to greet us with a big smile. She told us that her children work with her but she also hires people to help harvest the beans and pays them around $6 per day, and they all work from sunrise to sunset. 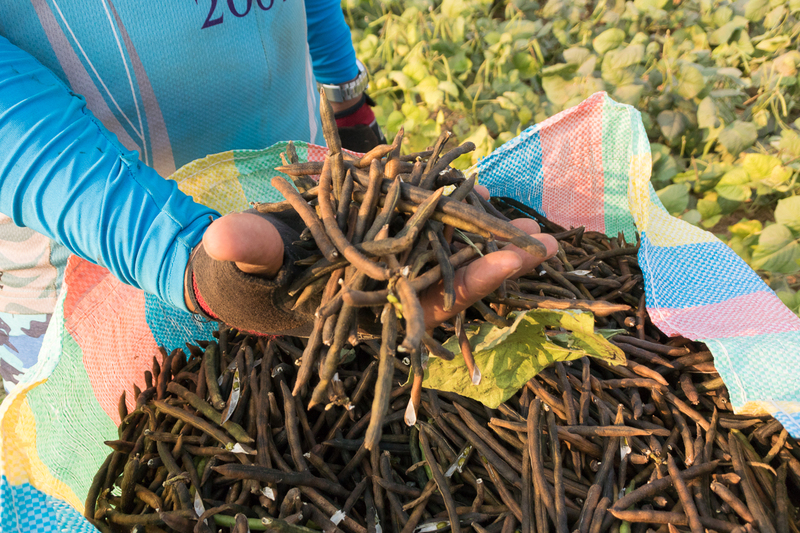 A different section of beans is ready for harvest every two weeks and they’re sold to a dealer who takes them to market, where they’re eventually sold on to be manufactured into soy sauce. She was keen to stress that without the loan from the credit union she wouldn’t have been able to grow such a good crop, and it’s also allowed them to buy another couple of hectares of land nearby helping to increase their income further. By now it was late afternoon and most of the group opted to hit the road and cycle back to the hotel to cover the miles they needed for their sponsorship targets, but we stayed on with Tracey and Regan to meet one last entrepreneur, Miss Bon Chet, who grows beans and rice on half a hectare of land. Unlike the other entrepreneurs we met she’s single, but has looked after her grandfather since her parents sadly passed away. She charmed us all with her smile and made us laugh when she said that she’s doubly happy about her loans; she’s happy when she gets them and happy again when she pays them back! 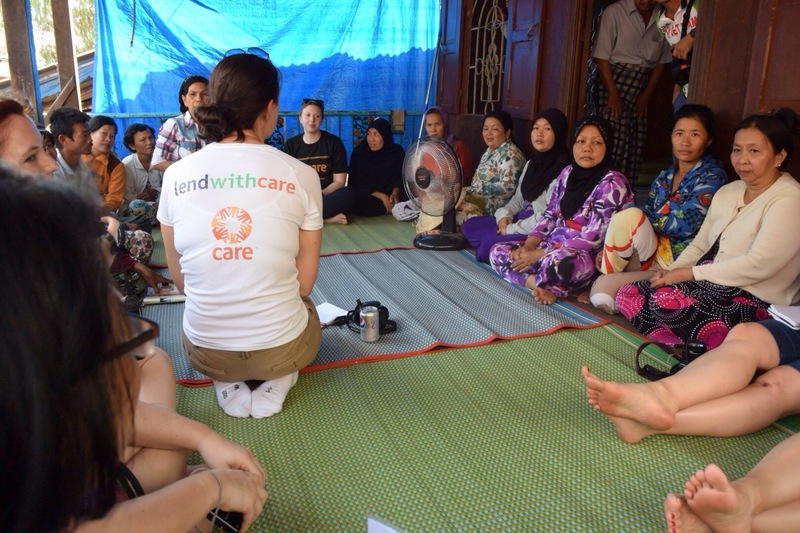 It was a real privilege to meet the local entrepreneurs and see Lendwithcare in action. All were unhesitatingly positive about the help and support they received and happy to answer all of our questions. As most people didn’t know we were coming, there was no question of our visit being set up or entrepreneurs being prompted to say what we wanted to hear. One of the great things about being a Lendwithcare lender is getting to choose what schemes you invest in. Seeing these entrepreneurs really brought the process to life and gave us a great insight into the businesses and challenges they face. It also strongly reinforces the positive difference that Lendwithcare makes to individuals, families and communities. It was particularly special to have met someone whose profile I read over a year ago and which triggered me to make a loan. It was only £15 but along with 78 other lenders doing a similar thing we had a positive impact on the lives of this entrepreneur and his family. 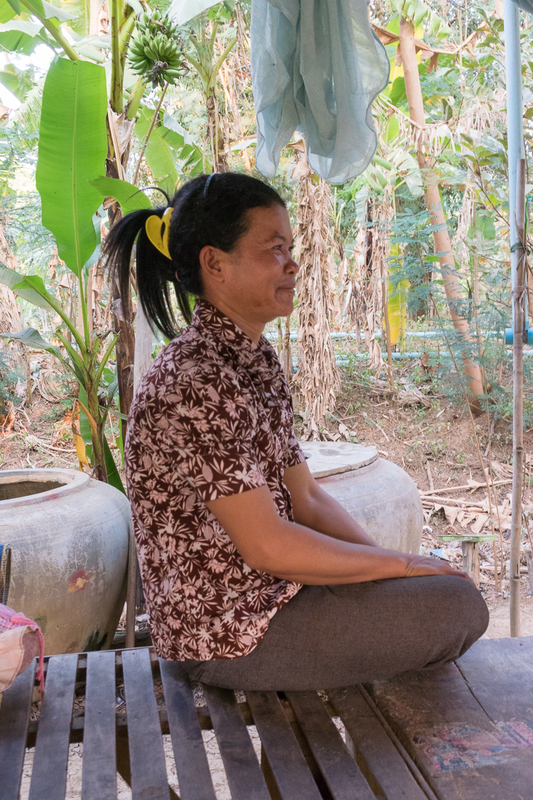 Chenda has already repaid more than half of his loan, highlighting that Lendwithcare isn’t really about charitable giving in the traditional sense; it’s about creating opportunities. Helping people to help themselves. This was the day that nearly broke Gary and I, mentally and physically. 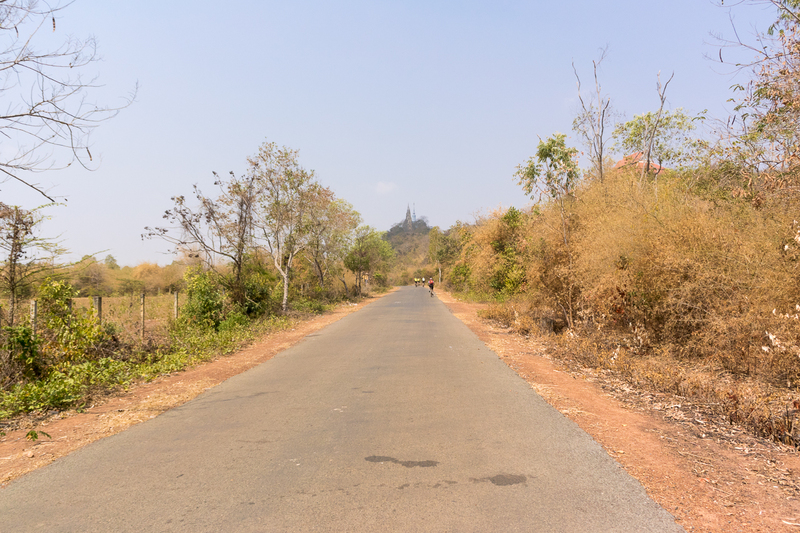 It was to be our first day cycling in Cambodia, and a rather different environment from what we’d encountered in Vietnam. 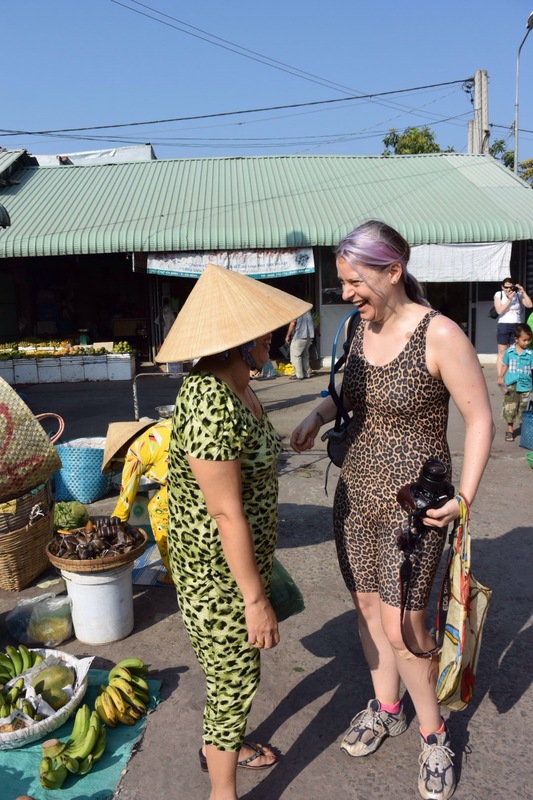 We started at 07:30 with a minibus ride out of the city, picking up our packed lunches from the restaurant where we’d eaten the night before and passing through a local market. 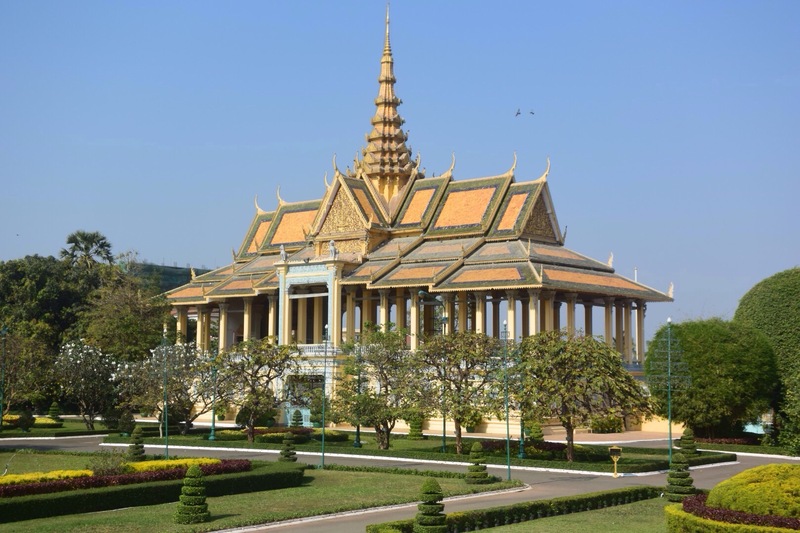 We stopped in the grounds of a temple where Tree and Veng helped set up our bikes. These didn’t look quite so new and shiny as the bikes we’d had in Vietnam, and the chains and cogs appeared rusty. But, as we soon discovered, this was down to the red dust roads, rather than a lack of maintenance. With only a few minutes to test out our new transport, we were off and straight onto a busy main road. The scooters and cycles of the past few days were replaced by cars, trucks and massive lorries and the road surface changed from tarmac to gravel at regular intervals. It was a stressful introduction to our new bikes and a relief to turn off onto the quieter local roads. Once again, there was a big contrast to Vietnam. 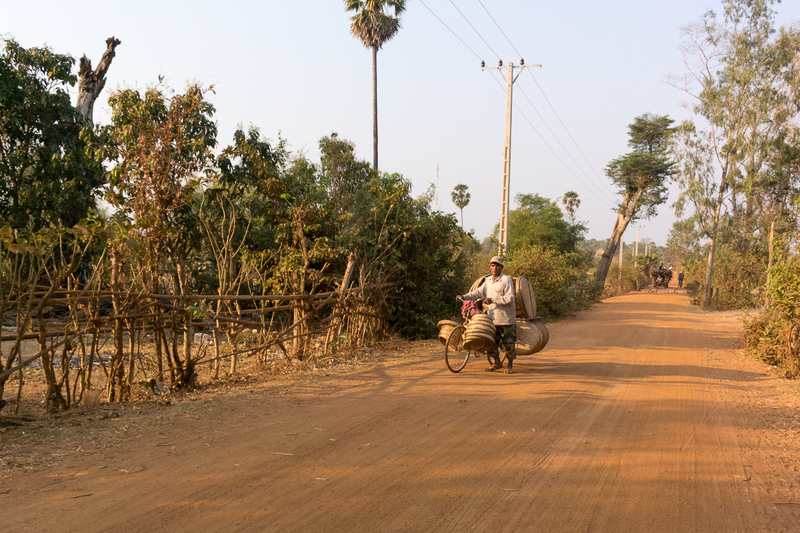 Unlike the lush coconut and banana plantations we’d cycled through, here everything seemed drier, and we kicked up a fine layer of red dust as we travelled along the long straight roads. 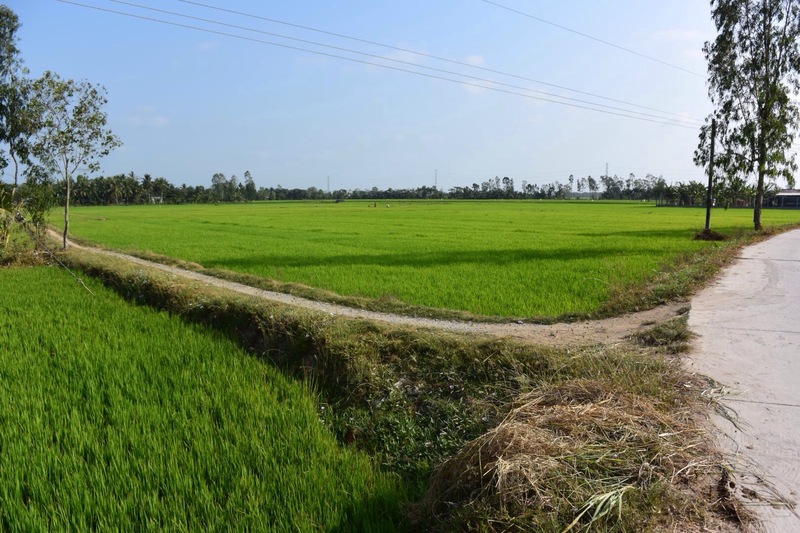 We saw the vivid green of the paddy fields, but fewer other crops and trees to provide the welcome shade we’d enjoyed in the Mekong Delta. We still got shouts and waves from the children and villagers as we passed by though. And instead of dodging scooters and bikes, we found ourselves cycling through a herd of water buffalo. These beautiful animals paid us little attention, their faces soft and serene as we cycled through. Our first stop was at a Buddhist temple, a perfect place to calm frayed nerves and take stock of our new environment. 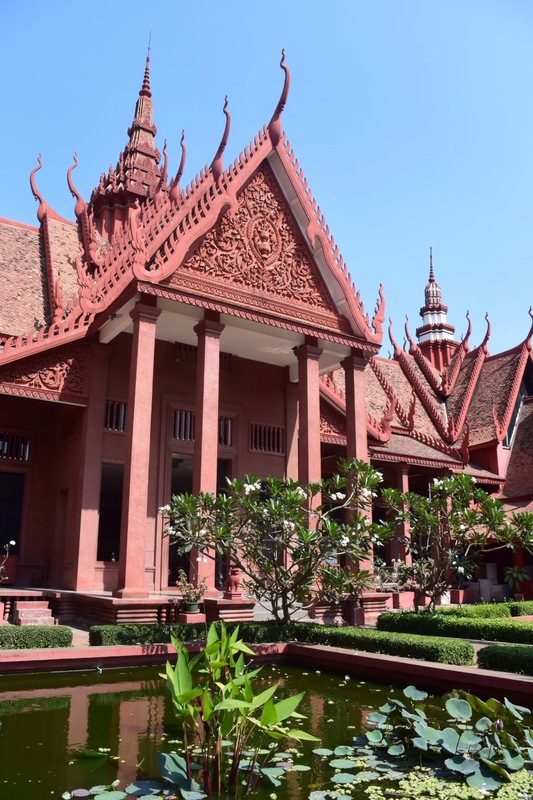 There were many stone statues of the Hindu and Buddhist gods in the outer courtyard, many of which depicted figures riding on animals, including a rat, a tiger and a hare. In the temple itself, we all received a blessing from a monk dressed in traditional orange robes. He tied a red cord around our wrists and wished us a safe journey. We had a good distance to travel to day, with the original plan for 70km increased to 90km. So we pushed on over the dusty roads, climbing a little as we reached our lunch stop, at the foot of a hill with a grand building at the top. 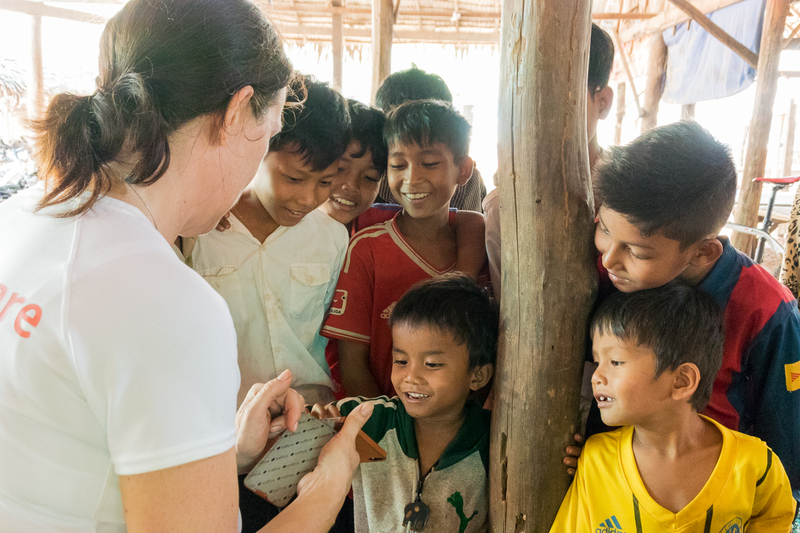 As we sat in a shady enclosure, equipped with hammocks, and opened the palm leaf boxes that contained our lunch, the local children came and spoke to us, in perfect English. At first, I thought they were just asking a list of questions by rote, but it soon became clear that actually they understood our replies too, and we were able to ask them about school and their ambitions. They obviously have plenty of tourists to practice on. Tree found us a local delicacy to try alongside our rice, fish, meat skewers and fruit. We’d never eaten ants before, but seasoned with salt, pepper and chilli, they were quite tasty. 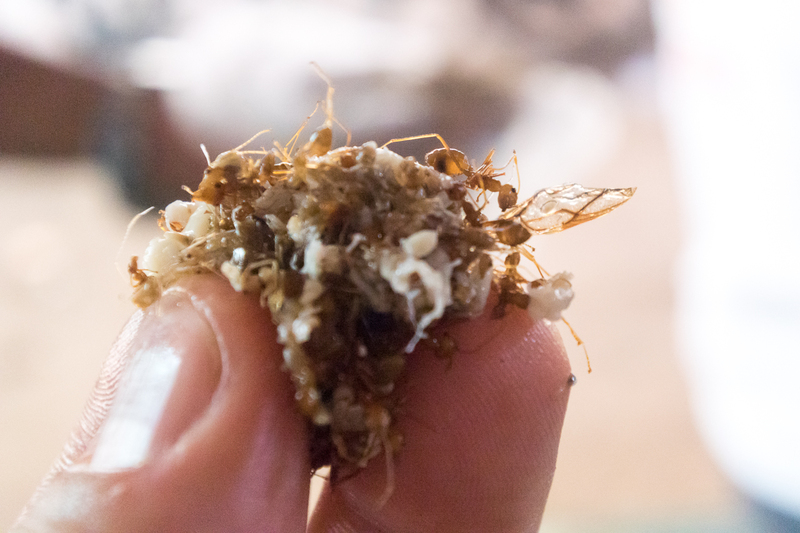 Tree ants – surprisingly tasty! 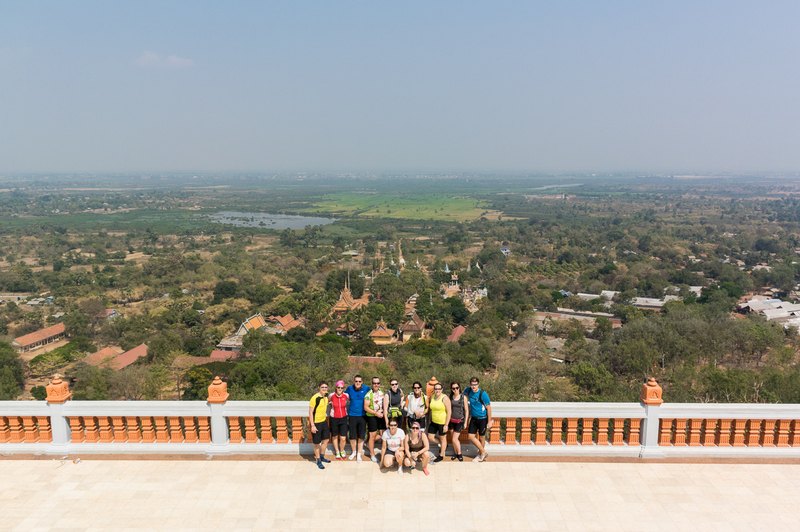 After lunch, we climbed up to the top of the hill to see the tomb or stupa, where the ashes of the Kings of Cambodia are interred. As if our legs weren’t working hard enough on the bikes, we had to tackle 509 steps to reach the summit, but the views over the surrounding area were worth it. Back down to the bikes, and the temperatures had risen to 42°C and we had another 20 mile stretch to complete before our next stop. The heat coming down from the sun and radiating up from the red dust road was relentless, and there was nothing in the way of shade. I really started to feel the effort and dropped to the back of the group, struggling to keep up the pace, and seeing the distance between me and the rider in front increasing until they were well out of sight. It became something of a mental battle after that. I felt like I was getting more out of breath than I should have been for the effort I was making. I went through a mental checklist of my body, and came to the conclusion that I was likely in danger of over-heating, if I tried to push on any harder. So I decided not to chase the pack, but eased back the effort even further to bring my heart rate down and to keep on going at my own pace. After what felt like a good half hour, I caught up with the group at a crossroads, and Doctor Alex gave me a spray down with some cool water, which definitely helped as we pushed on to the next rest stop. 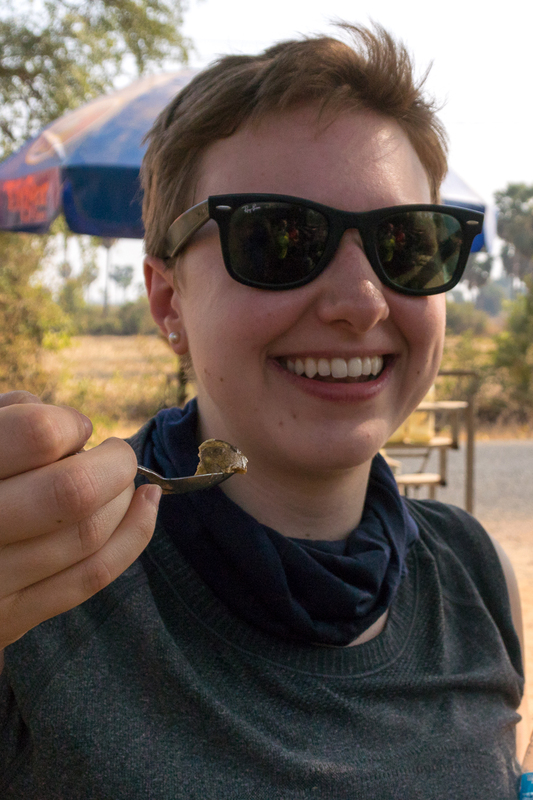 Here Regan and Tree tried another local delicacy – a boiled, fertilised duck egg. The heat remained a tough challenge through the rest of the afternoon’s cycling. It’s the dry season and the ground is cracked and dusty. 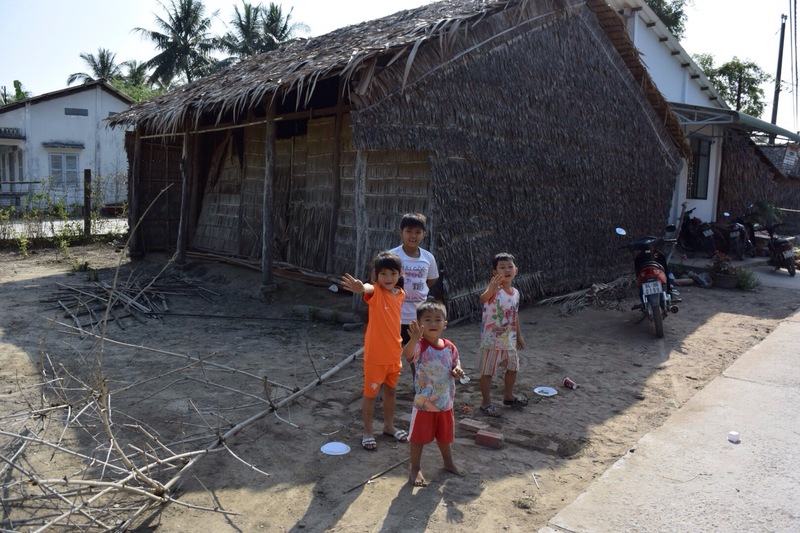 But the houses on tall stilts by the sides of the roads show just how dramatically the landscape changes when the rain and floods come in the wet season. After the last short refreshment stop, the final stretch was a tarmac road where we were able to pick up and sustain a good burst of speed for a few miles. As the light began to fade, we ended our cycling day in a busy village and caught the bus back to our hotel, more than ready to rinse off the dust, and sweat that made it look like we’d had a very bad spray tan. 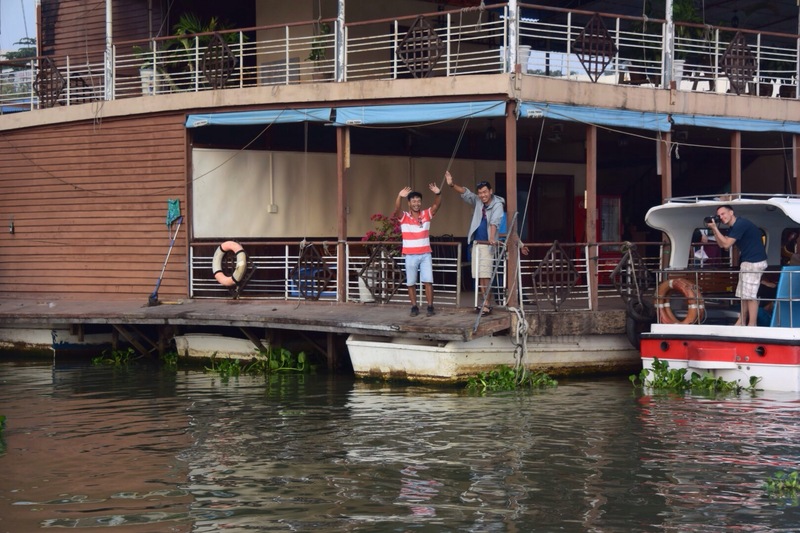 We left the hotel at 7am to catch our chartered boat to Phnom Penh. We were sad to say goodbye to Phat and Hai who had looked after us so well for the last few days. We had the boat to ourselves so it was nice to be able to stretch out and take in some of the scenery along the banks of the Mekong River. The wide open expanse of the river gave a different perspective from the narrow roads and paths we’d been following on our bikes. 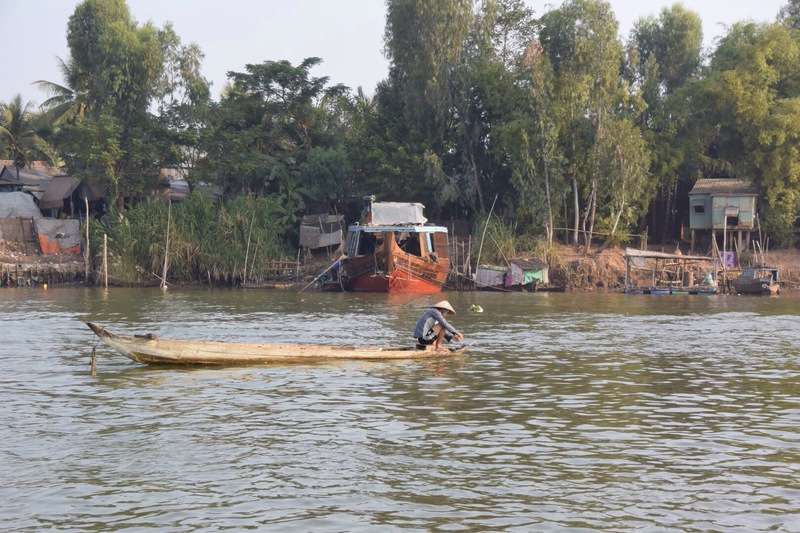 After about an hour on the boat we reached the Cambodian border where we had to disembark. Phat and Hai had sent our passports on ahead of us to expedite the Cambodian visa application process. We sat in a cafe-come-waiting room whilst the paperwork was being sorted where a local soap opera was airing on the TV. We all became quite engrossed at the drama being played out, where a wedding appeared to be going horribly wrong with guns being drawn. It was never like that for Scott and Charlene! 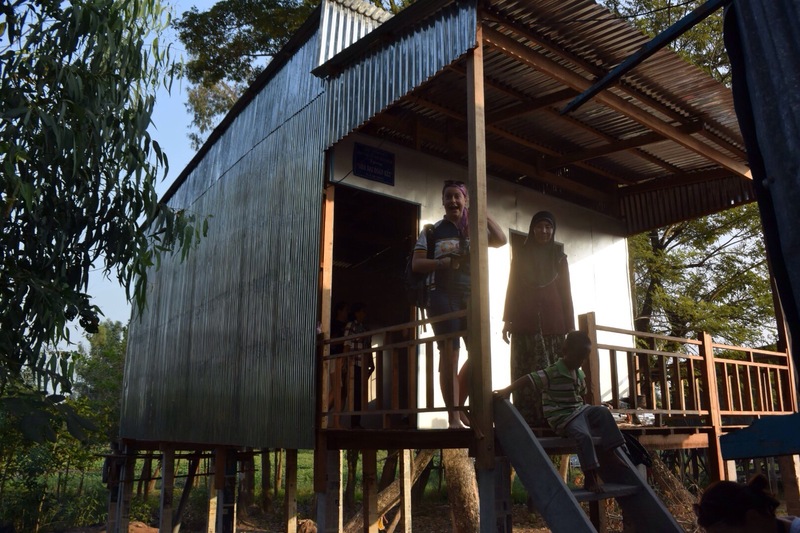 After about 15 minutes we were called back to our boat where we spent another 4 hours sailing up the Mekong. This was a chance to catch up on some sleep after the previous late night and also a bit of blogging that the last few long days hadn’t permitted. 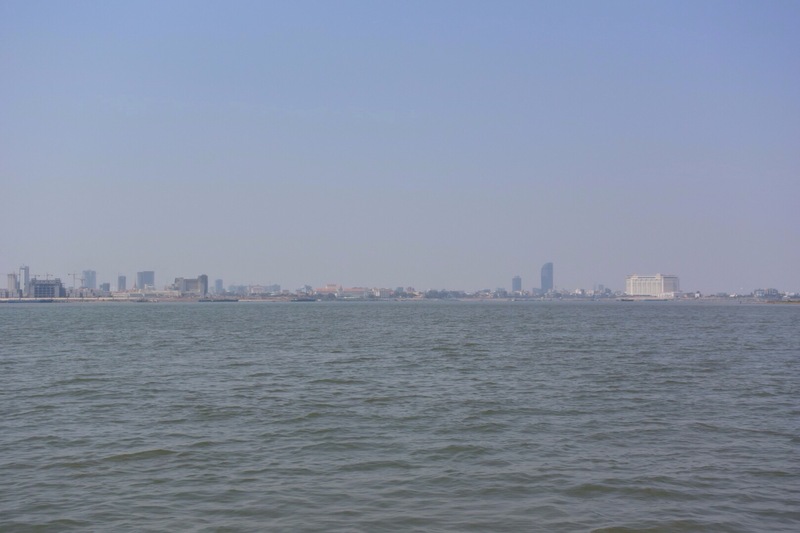 Eventually we started to see Phnom Penh in the distance, and as we got closer tall buildings seemed quite alien after the last few days. Coming in by boat was an amazing way to arrive in the city. 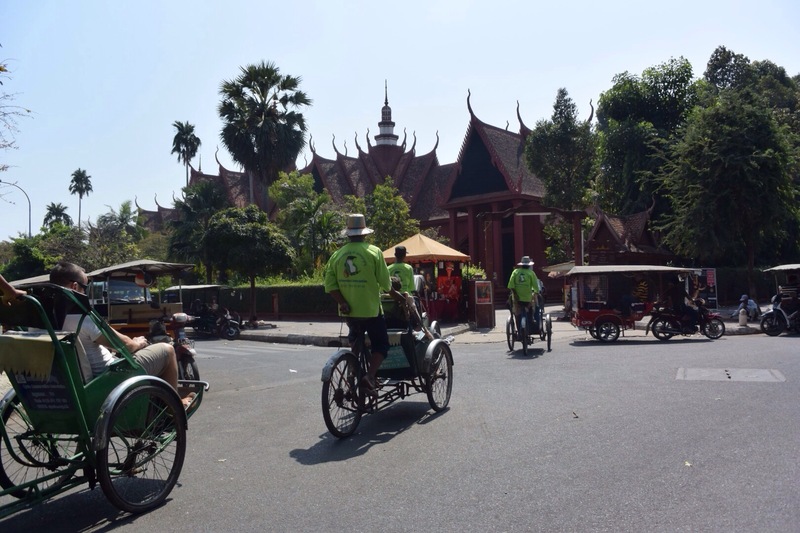 We met our guides, Tree and Veng, who gave us an introduction to Phnom Penh as we made our way to the Foreign Correspondents Club for lunch. The airy, French colonial style setting was a huge contrast to our recent local lunches in road-side snack stops, but the food was just as tasty and the cocktails were well received. This is where many of the foreign correspondents used to hang out during the war, and it was from here that the fall of Pol Pot was first reported. So it was like stepping back in time. After lunch we headed into the city for some sight seeing. We were transported in style by rickshaw. It was nice, but rather odd to have someone else pedalling for a change. Our first stop was the National Museum where we had a short guided tour. All the artefacts here were dispersed during the war and many were damaged or destroyed, but now there are over 1,000 objects on display. Our guide showed us several statues that demonstrated different influences over time. 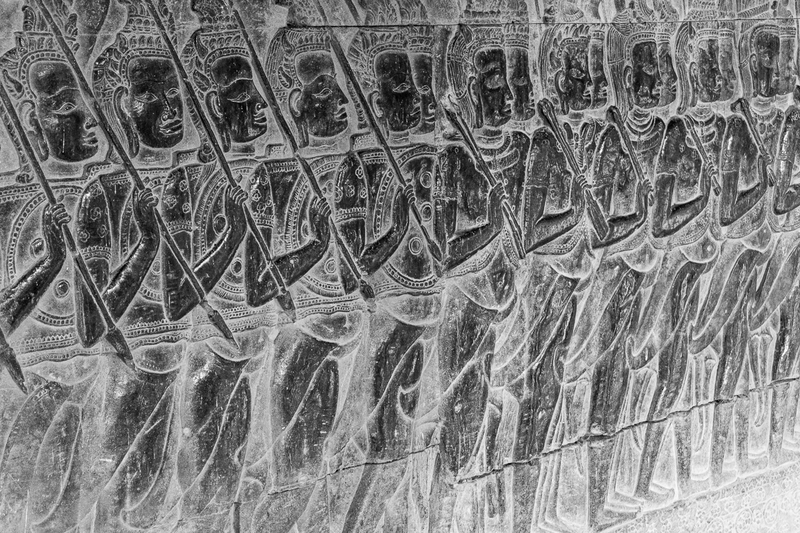 Some of the figures were very slim and carved very smoothly, rather like Greek or Roman statues. Others showed more decoration, and showed fuller figures and smiling faces, representing happiness and prosperity in Cambodia. Our next stop was the Royal Palace nearby, with a blue flag flying over the royal residence, showing that the king was at home. We explored several richly decorated and lavish buildings here, full of gold statues, including a 92kg solid gold standing Buddha and another carved from emerald. Our final stop was rather more sombre and far less ostentatious, as we paid a visit to S21, a former school that was used as a prison during the era of Pol Pot. The camp rules, posted on a board in the courtyard, included the instruction not to cry out when being electrocuted, and the whole atmosphere was chilling. To hear and see photos of the systematic torture and destruction of families and communities, all within recent, living memory was a stark reminder that human beings can be capable of some terrible things. This was brought further into focus when we met Chum Mey, one of only seven survivors from the tens of thousands that passed through S21. He didn’t escape the torture but did avoid the killing fields because he was a mechanic by trade and was able to use his skills to repair the typewriters of his captors. Tears were filling his eyes as he recounted his time in S21, and how his family weren’t as fortunate. They filled mine too. A 6:30am start this morning and a short minibus ride out of the city. We were promised a relatively short and easy paced ride after the previous two long days, giving us plenty of opportunity to take photographs. It was slightly cooler at this time in the morning as we set off. 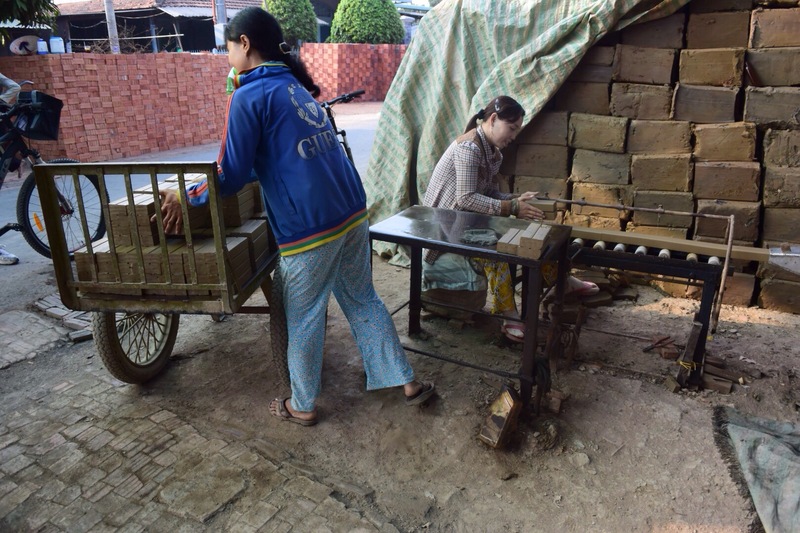 Along the riverside route we saw a man making Chinese Dragon heads for the upcoming New Year celebrations, and women making bricks. There were also several field of yellow and gold flowers that looked like marigolds. Also some sunflowers and lilies. The roads were quite good condition and we cruised along quite comfortably. 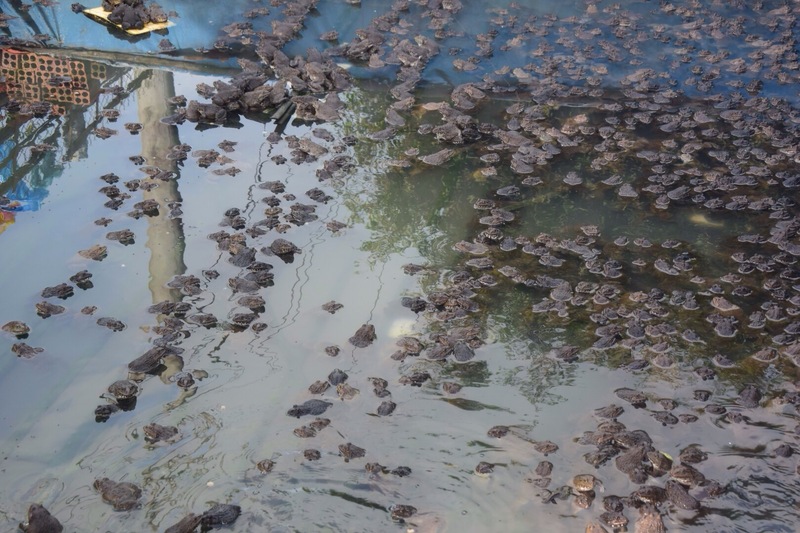 We stopped at a frog farm which were being reared for meat. The Vietnamese call these “jumping chickens”. We enjoyed fresh coconuts at the first rest stop – the coconut water was very refreshing and the flesh delicate. 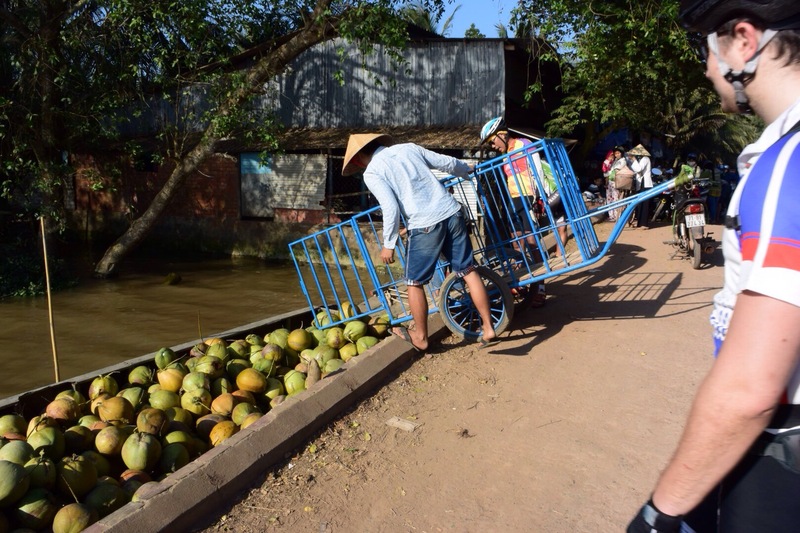 As we sat by the bank of the river the coconut and water boats arrived to replenish the shop stocks. The most challenging part of the ride this morning was 3 large bridges one after another, with sharp 90 degree bends in between. By this point though we’d all achieved a level of technical ability that meant we navigated our way through without incident. We had an easy ride to ride to the lunch stop where we enjoyed vegetable and fruit salad, omelette and beef, rice and soup. As we were leaving Kathryn spotted a boy also sporting purple hair, cue another photo opportunity! 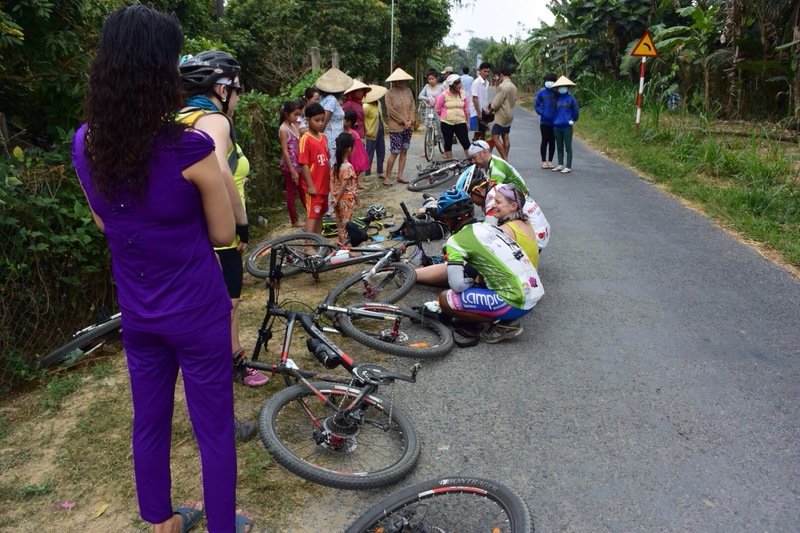 Eventually we reached a small town where the Vietnam cycling part of our trip was to end. It was strange to remove the seats and pedals and say goodbye to our bikes, which (on the whole) had looked after us well for the last few days. We boarded the minibus for the journey to our hotel, and once again the landscape changed. Mountains suddenly appeared on either side of the road which seemed very alien having spent 4 days cycling through flat lands. At the hotel we had a very fast turnaround as time was tight for us to visit a nearby CARE climate change project. A local CARE representative joined us on the bus and explained the background to the project. It has a number of goals but the crux of it is to give people the knowledge and means to adapt and cope with the impact climate change is having on their lives. We sat down for a meeting with quite a few members of the group and had the opportunity to ask them questions about what they were gaining from the project. Several had received microfinance loans to expand their business, although this was only a small part of the program and run locally and not through lend with care. Most of the group were women, for whom a key benefit was to be able to set up a business they could run from home, such as a stall to sell gifts or fabric. One of the gentlemen was a pig farmer and the project had helped him use a new way of bedding down his pigs which didn’t take as much time but also provided a better by product that could be used to fertilize the land. After the meeting we went for a short tour around the village where one of the group members proudly showed us her newly built house. In fact it was so new she hadn’t yet had time to move into it with her son who has difficulty walking after suffering from polio when he was younger. We had an opportunity to buy gifts from some of the locals that had stalls. Their sales skills were second to none, with great knowledge of their products and taking every opportunity to up-sell. We also saw one of the women weaving elegant scarves. By now the sun was starting to set and so we headed back to our hotel. Knowing that this was our last night in Vietnam and that we didn’t have to cycle the following day, we headed off after dinner to a karaoke bar across the street. The Vietnamese love karaoke so we’d been keen to indulge in this part of the culture having heard loud music coming from the most unlikely places over the past few days. With crates of beer and water brought into our room we all sang the night away, and just after midnight gave a rousing rendition of “Happy Birthday” to Dan. A fantastic evening that was a fitting end to our time in Vietnam, a country that I want to come back and explore in more detail. 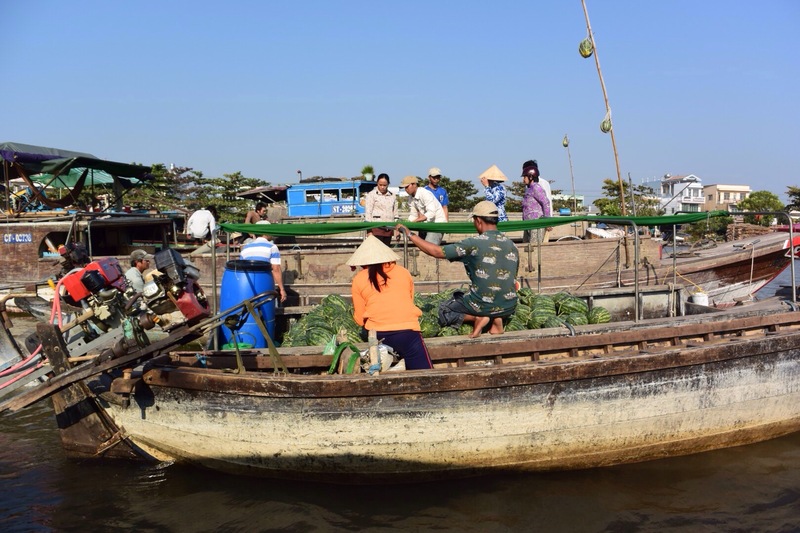 After breakfast we took a 30 minute boat trip to visit to the floating market at Can Tho. Large wholesale boats advertise their produce by hanging it from poles high above the boat. 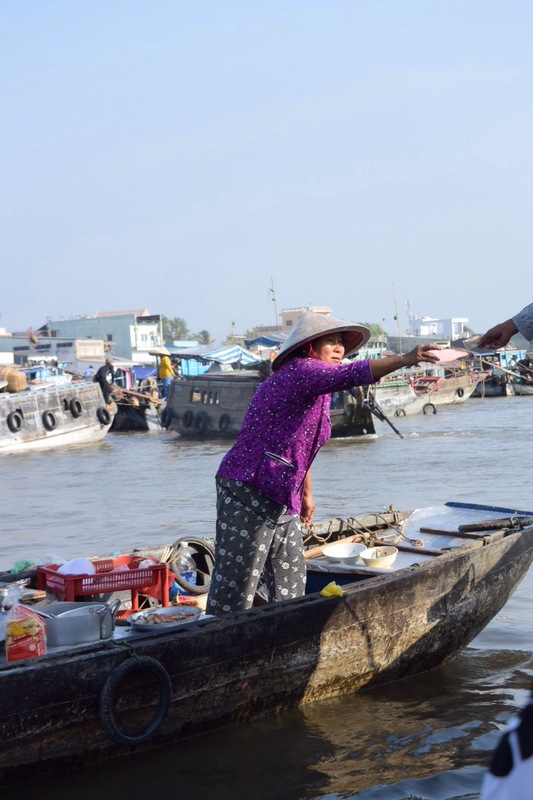 Each boat has only one type of produce on offer, and we saw spring onions, watermelons, and coconuts dangling above. Smaller boats visit the wholesalers to buy the produce that will then be sold back on land at local retailers. Other boats zip around amongst all the traders offering coffee and drinks as well as hot meals – in fact one brought our boat driver his breakfast. 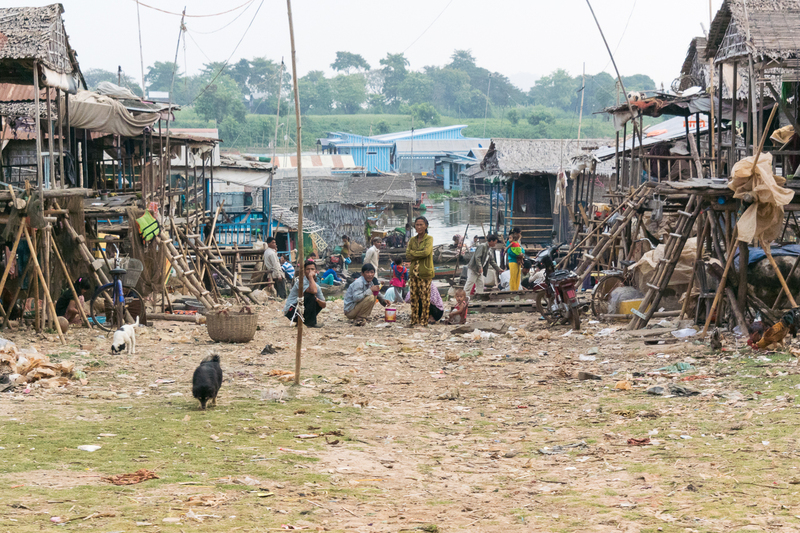 We disembarked at a market on the bank of the river full of women buying fruits and vegetables to take home. I love visiting food markets as they’re always full of life and this one was no different. Kathryn in her leopard-skin cycling suit spotted someone else wearing an animal print who found it quite amusing. Outside the market we jumped back on our bikes to start another long day of cycling. Once again the scenery changed and we started to see more bamboo and vegetable oats grown by the side of the road. The winding narrow paths were also replaced by more paved and relatively smoother roads, allowing us to cover the distances in less time. We were all more cautious though after the previous day’s mishaps. Gill demonstrated incredible guts and determination by cycling the whole day, despite her shoulder being strapped up. Laura suffered from a couple of punctures but these were quickly repaired by our elite team of Hai and Phat. 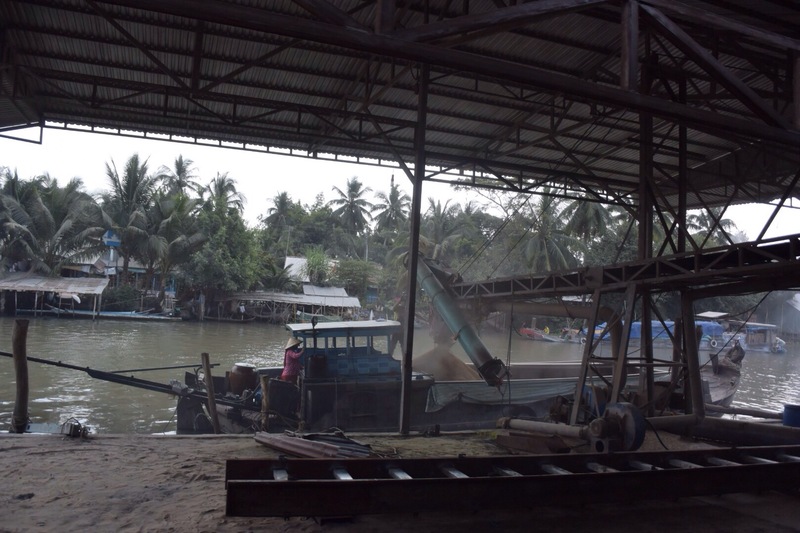 Rickety wooden bridges were carefully navigated and along one section we were plunged into darkness as we went through rice processing plants. At one rest stop an older Vietnamese gentleman came over to talk to us. He explained he was a veteran soldier and showed us the tattoos on his arms from his army days. We covered a lot of ground before stopping for a lunch of catfish, soup, rice and delicious beef and green beans. The afternoon was more of the same cycling and terrain. At one we point we stopped alongside a very minimal bamboo bridge across a river. Phat encouraged us to have a go but most of us declined the offer, especially having seen how much it flexed and bent as he crossed it. Regan took the challenge to a new level though with a bit of yoga in the middle for good measure. At our final rest stop of the day Daryl joined in a with a game the local kids were playing – keepy uppy with a large shuttlecock. Towards the end of the day, we approached one village where we could hear loud techno music coming from a house on the other sound of the river. As we passed through the village, people of all ages greeted us with enthusiastic hellos, which helped to inject some much needed energy into tired legs. We all nicknamed it the “happy village” and it was a great way to finish the day’s ride. On the minibus to the hotel, Phat gave us a potted history of the Vietnam war to help us understand some of the things we’d seen. The whole group enjoyed private dining at the hotel, which was enlivened when Phat and Hai brought us a bottle of Vietnamese rice wine to try. At 50% proof, it’s much potent than Japanese saki, which resulted in a very merry evening! This was a day full of drama. A tale of two punctures, three crashes, a sore bum, one dislocated shoulder and a broken fence. But we all survived to tell the tale. We left the hotel at 7am, after the scheduled 80k was amended to 90k to give us a similar length ride the next day. Our first stop wasn’t far from the hotel, where we visited a Buddhist temple. 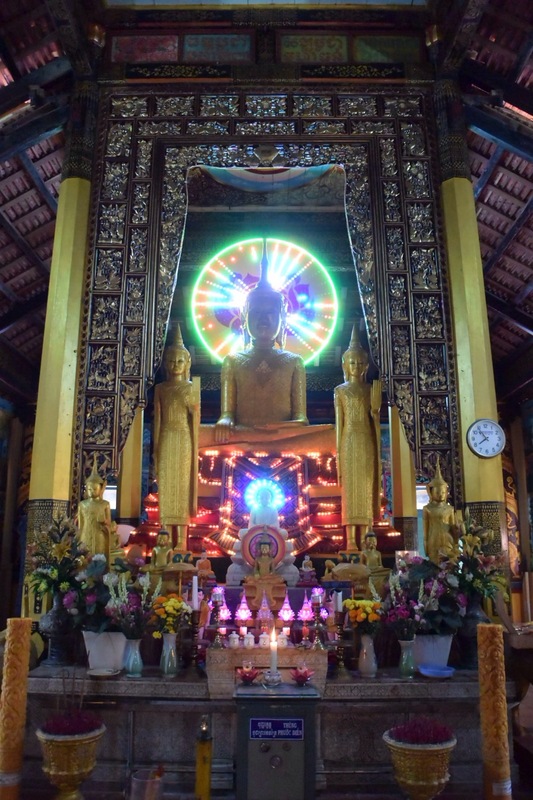 The custard coloured walls and gold decoration alongside the monks in their orange robes were what we expected, but the neon lightshow inside the temple building was a bit of a shock. Leaving the temple, we were immediately into a different landscape from the day before. 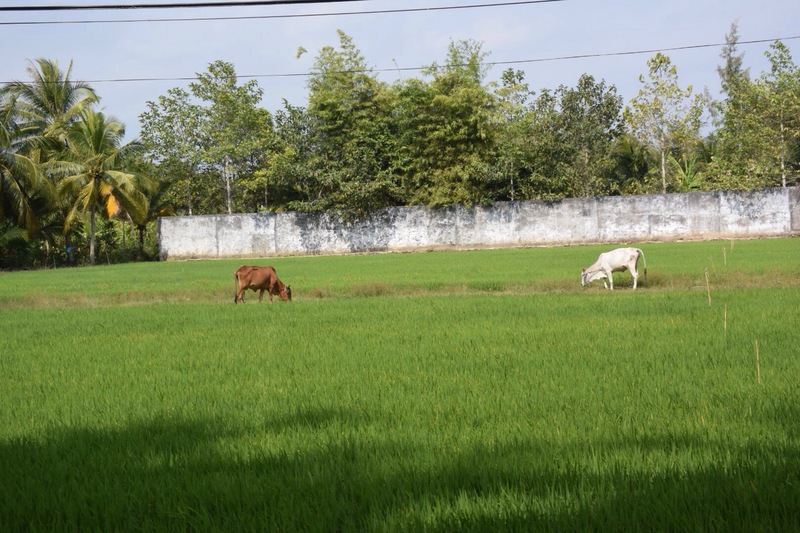 The vistas were more open, flanked by lush green paddy fields instead of coconut trees. Once again each twist and turn brought a new sight, from ducks in the canals, to water buffalo in front gardens. Not to mention the three gentlemen carrying quite a few live ducks in bags attached all available parts of their scooters. With narrow paths and rough surfaces, this twisting turning route took its toll, and our day of mishaps began with a couple of punctures in quick succession. Phat and Hai got the bikes back on the road in no time though, and the short pause in our journey gave us time to catch our breath and breath in our surroundings. Then Daryl took an unplanned detour into a paddy field after being caught off balance whilst looking over his shoulder to check riders behind were OK. To those of us in front there was the sound of something crashing through undergrowth and he was gone. Off the bike and in the undergrowth, unfortunately losing his camera in the process despite Hai’s best attempts to find it. Then shortly afterwards, Jo came off her bike and tumbled 8 feet down a bank, almost ending up in the river. She was incredibly brave, and after being checked out by Dr Alex was back on her bike, bearing a few cuts and bruises and a sore wrist but still smiling. Michelle dropped out of the final stage before lunch when her bruised bottom proved too painful for each pedal stroke. But after a reviving lunch, a seat adjustment, and some painkillers, she completed the rest of the day back in the saddle. The children that run out to shout hello and wave at us are a real boost, particularly on long days like today – it gives me more of a burst of energy than any gel would do. The next incident back on the bikes was thankfully relatively minor. 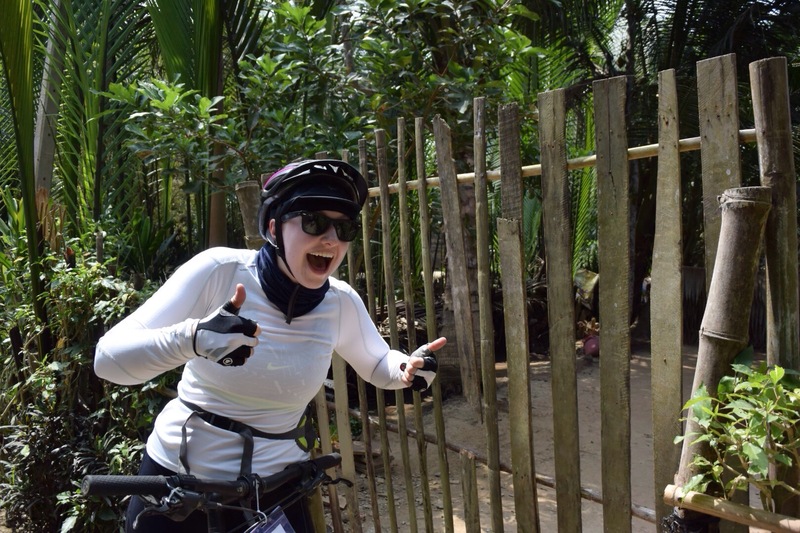 The route through the paddy fields involved a number of sharp bends and at one Regan ended up crashing through a fence. Thankfully she came out unscathed but the fence needed a bit of patching up. The final and most dramatic incident too place in the middle of the afternoon when Kathryn and Gill bumped handlebars whilst travelling at speed, and both ended up flat out on the tarmac. We really appreciated having Dr Alex with us, as a calm head who immediately assessed the situation and took control. He relocated Gill’s shoulder on the road and cleaned up her grazes, as well as patching up Kathryn too. The way that Alex, Phat, and Hai managed the whole situation was superb. They got transport to take Gill to a nearby hospital for an X-ray, while the rest of us continued our ride. There was a huge round of applause as we picked up Gill from outside the hospital, wound dressed and strapped up. She was smiling and making light of it, but it must have been a very scary experience. 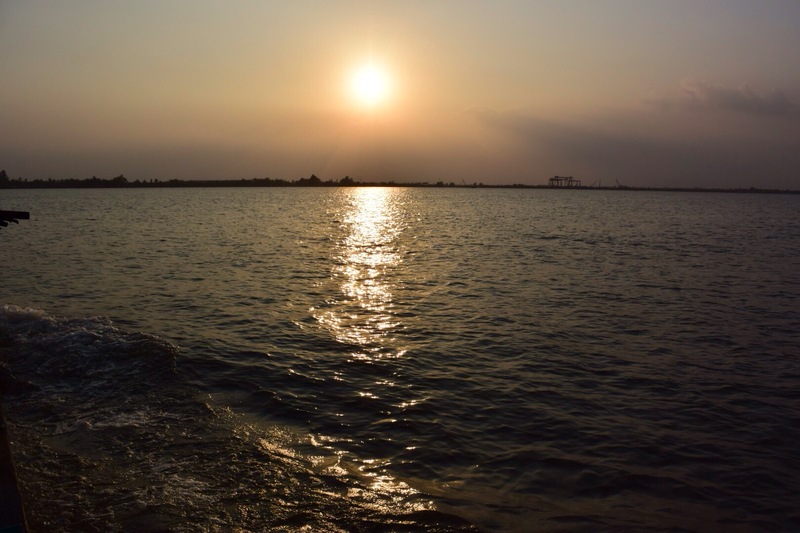 Thankfully the rest of us made it to the end of a long day with no further mishaps, and enjoyed a beautiful setting sun as we took a ferry ride across the river to Can Tho. We set off from the hotel at 8:00 this morning for our first day of cycling, however our journey started on the minibus rather than the bikes so we could avoid the worst of the traffic in Ho Chi Minh City, a city with a population of 10 million people and 5 million scooters! After about an hour and a half on the bus we pulled over for a brief rest stop where we could stretch our legs, get some coffee or juice in beautiful gardens with with lily-filled ponds. Another short 20 minute hop on the bus took us to our rendezvous point with the truck carrying our bikes, and we finally saddled up to begin our cycling challenge. 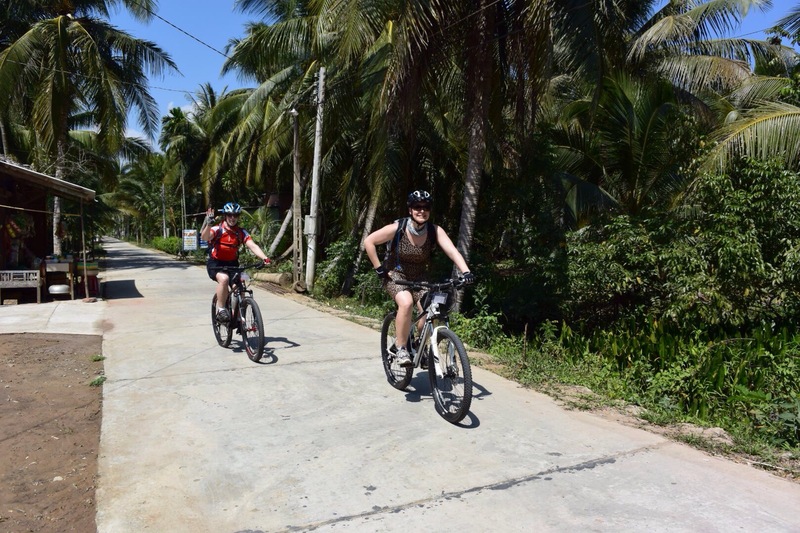 We started out cycling on the main highway out to the Mekon Delta, but soon pulled off onto the narrow white concrete paths surrounded by coconut palms. At first it felt like we were cycling through some sort of park, but these paths are in fact the arteries that connect the villages to one another – with traffic dominated by 2 wheels there’s little need for wide roads. The group quickly became skilled in avoiding oncoming scooters, pedestrians, and cyclists, and shouts of “Bike!” passed from the back to the front warned of traffic approaching from behind. When we arrived at a small town bordering the mighty Mekong River the narrow paths became wider roads once again, but the sheer volume of traffic meant we had to keep our wits about us to avoid colliding with someone or something. We’d all done plenty of training in the run up to the event, but nothing could really have prepared us for this! Normal conventions of driving or cycling on the right hand side of the road were abandoned as scooters and vans approached from all directions. In the briefing the previous day, Phat and Hai had told us that problems only really happen if you do something unpredictable. And sure enough, moving ahead slowly but confidently we threaded our way through the traffic unscathed. As we returned to narrower paths, a blast of loud music and balloons alerted us to a wedding party taking place. Shouts of hello greeted us and some of the children rushed out to give us high-fives as we passed. This part of Vietnam is very flat, so hills aren’t something we have to worry about too much. In fact the only real ascent we encountered today was a large bridge over the Mekon river which rewarded us with fantastic views in the centre and a lovely descent down the other side! 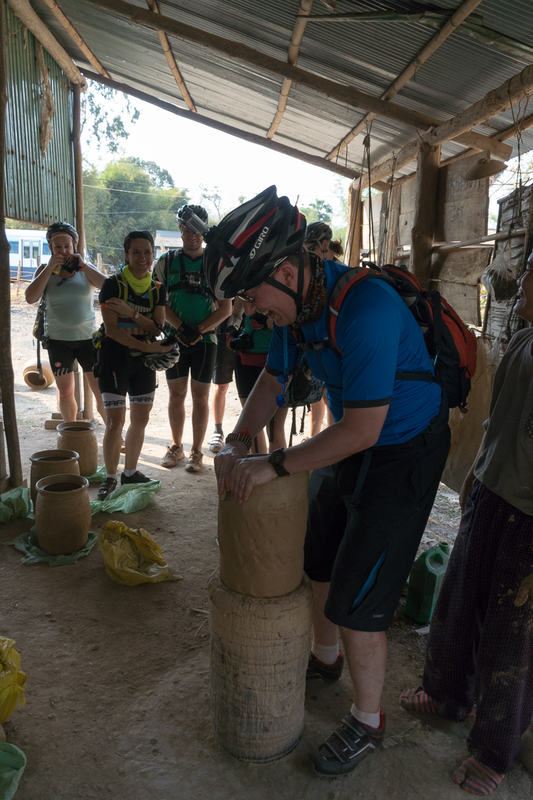 Just over the river, and having cycled for about 90 minutes, we had our first rest stop where Phat and Hai distributed ice cold drinks and a real treat of freshly squeezed sugar cane juice. The dark green hue of the liquid suggested it might taste like some sort of vegetable shake, but instead our taste buds were rewarded with deliciously sweet flavours. After filling up our water bottles we were back on our bikes and back onto the narrow paths. You never quite know what you’re going to see when you go around each bend in the path, but it’s always interesting! it could be a chicken running out in front of you, shouts of hello, someone towing a pig in a crate on the back of their scooter, or a bridge over a river. On one particularly rickety bridge we found ourselves up against a truck coming the other way. With centimetres to spare he managed to pass us and we all managed to stay on the bridge and out of the water! 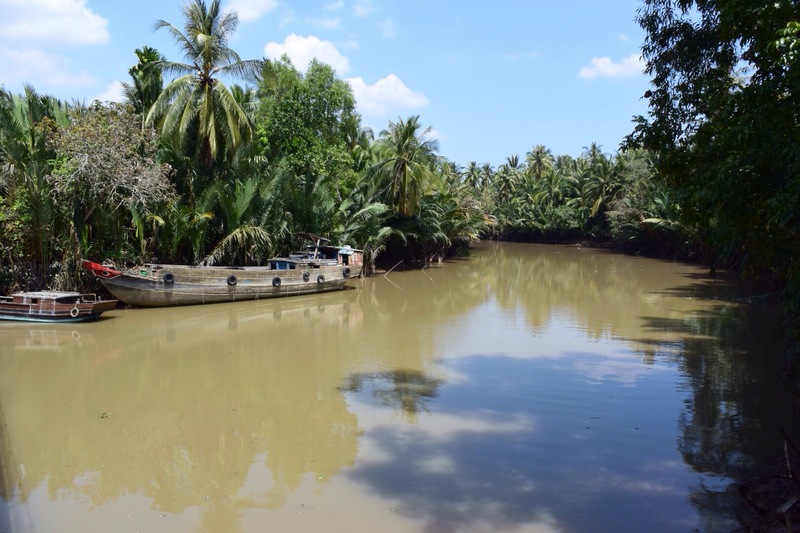 With so much water around, the Mekong delta is a fertile area for growing rice and all manner of other crops, so many of the people here are farmers. As we approached another small gathering of houses, Phat called out to go straight. Jo, who was at the front of the group was a bit startled, as there was nowhere left to go straight. Time to cross the river again on a small ferry, with just us and our bicycles on board. We stopped for lunch at a local store, where we ate a fresh noodle broth, with lime and chilli, then pork and rice with garlicky greens. 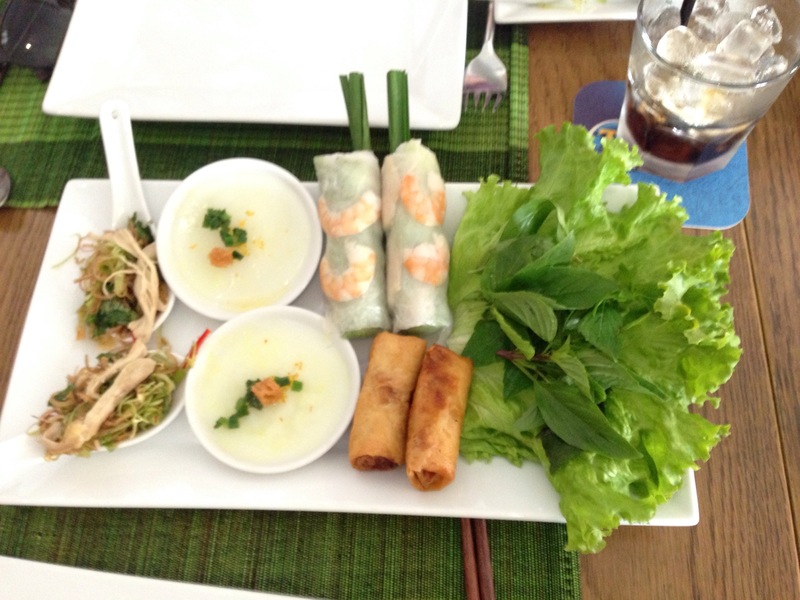 We’re certainly in no danger of going hungry on this trip – the food here in Vietnam is fantastic. 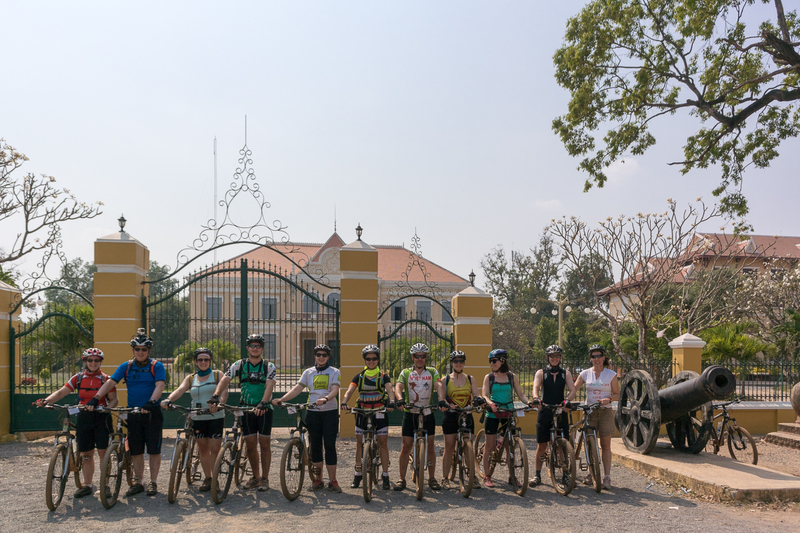 Suitably refreshed, we got back on the bikes and continued our journey towards Tra Vinh. Passing by the small farms and villages, you get a real glimpse of people just going about their daily lives, with washing drying in the sun and even more cheery hellos, even from the very youngest children who can barely have many words of Vietnamese in their vocabulary! We had a brief stop at a white building with what looked like a huge red flame for its roof. It looked like some kind of temple, but our guides explained this was actually a museum. It commemorates the Mekong Delta revolution in January 1960, which was the start of the Vietnam war. Just as we were about to set off, we had our first puncture but thanks to Hai’s wheel swapping and repair skills, Laura was soon back on the road. By mid afternoon, we were approaching our overnight stop in Tra Vinh. The terrain changed a little here, with dusty paths and more uneven ground. And soon there was another part of the river to cross. Phat told us this was a tidal, salt water area and the tide was high. As we waited for the ferry to arrive, we saw two men unloading a cart full of coconuts onto a boat at the dock. 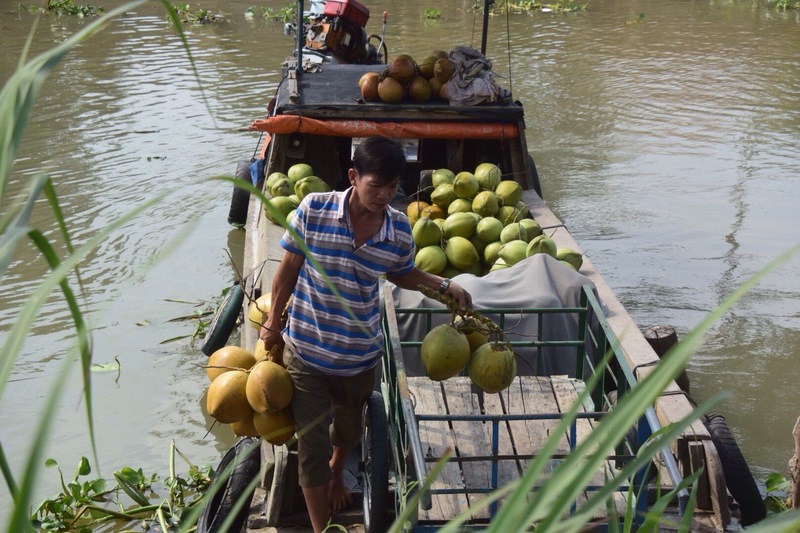 The boat was already pretty full and as the tipped the cart, some of the coconuts rolled off into the water. Luckily, coconuts float, and one of the men jumped into the water to retrieve them. This was a much wider section to cross, a journey of about two miles, and the ferry was busy with scooters and our bikes as well as a truck. The cooling breeze was very welcome as we took some time just to look around and drink in all the experiences of the day so far. 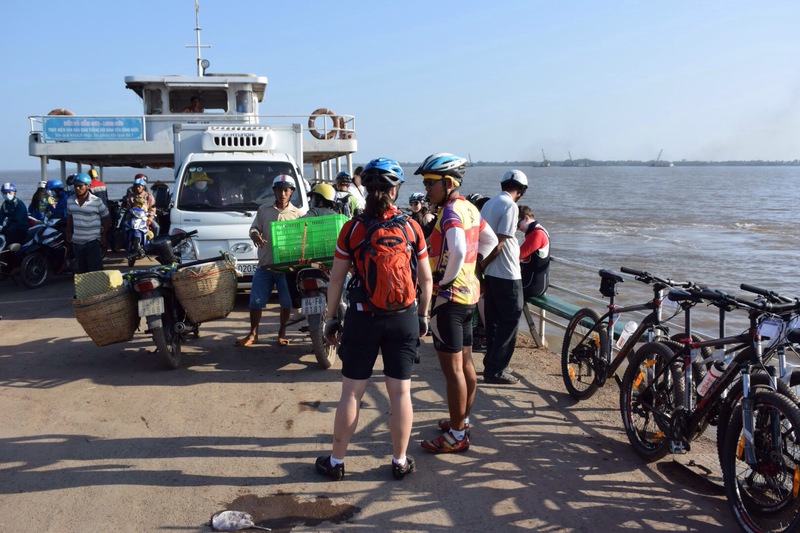 From the ferry crossing, it was a short ride to Tra Vinh. As we got closer, the roads got wider and we were joined by ever more scooters and bikes. Right of way seems to have no meaning here, and it can feel like traffic is approaching from every direction, but the key seems to be to keep looking ahead and not making any sudden changes of direction. After 13 hours in the air we arrived at Kuala Lumpur where we had a quick dash across the airport to catch our connecting flight to Ho Chi Minh City. This flight was only a short 90 minute hop from Malaysia to Vietnam, and it was fantastic to see the mighty Mekong river snaking its way underneath us as we approached our destination. Having successfully navigated immigration we made our way to baggage reclaim to discover that a couple of bags had gone AWOL somewhere along the way. Kathryn and Daryl filed the necessary paperwork with lost baggage, and we all made our way outside the terminal. And what greeted us was a seemingly impenetrable wall of people, sound and heat. 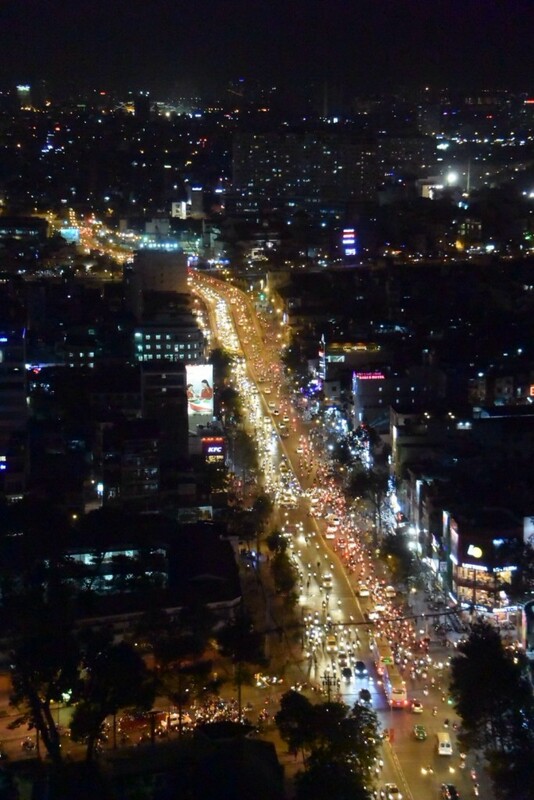 It turns out the number of people is higher than normal because of the imminent Vietnamese New Year festival of Tết. Somehow one of our Vietnamese guides, Phat, managed to find us amongst the throng and escorted us to the minibus that will be serving as our support vehicle whilst we’re in Vietnam. The air conditioning was most welcome (we were still partly dressed for the UK winter), as too was the unexpected on-board WiFi which allowed emails and messages to be sent back home and the ubiquitous check-ins on social media to relay news of our arrival. First stop was the cycle shop to try out our bikes for size and swap over pedals and seats for anyone that brought their own. We then headed off for lunch at a nearby restaurant, which started with some tasty soup followed by a selection of traditional Vietnamese vegetable, seafood, chicken and pork dishes. After lunch we checked into our Saigon hotel and some of the group then headed out to explore the nearby area. Our lack of sleep since Tuesday was starting to catch up with us though, so instead Michelle and I got our heads down for an hour-long power nap. We all regrouped at 5pm in the hotel for a briefing session from our group leader and doctor Alex, on how to stay safe and healthy over the next few days. Phat, who together with his colleagues Hai will be accompanying us on the Vietnam side of the trip, then covered all the logistical aspects and answered any questions we had. Having been simultaneously reassured and warned of the challenges ahead, we hopped back in the minibus for a short trip to the “Indochine” restaurant for dinner where another great meal of local dishes was accompanied by some live music. On the way back to the hotel Hai mentioned that we could get great views of the city from the Chill Sky Bar, at the top of a neighbouring hotel. The opportunity to see this bustling city from a different perspective was too good to miss, so after a quick change to ensure we met the venue dress code (no shorts, no flip flops) we all jumped in the lift and headed up the 26 floors to the top. The view that greeted us was a world away from the moped-filled streets we’d experienced on the ground. Like the on-board WiFi on the minibus, it challenged any expectations I had of this city. Multi-coloured neon lights, an array of corporate logos, and bright spotlights illuminate the spaces between the ribbons of moving lights below. 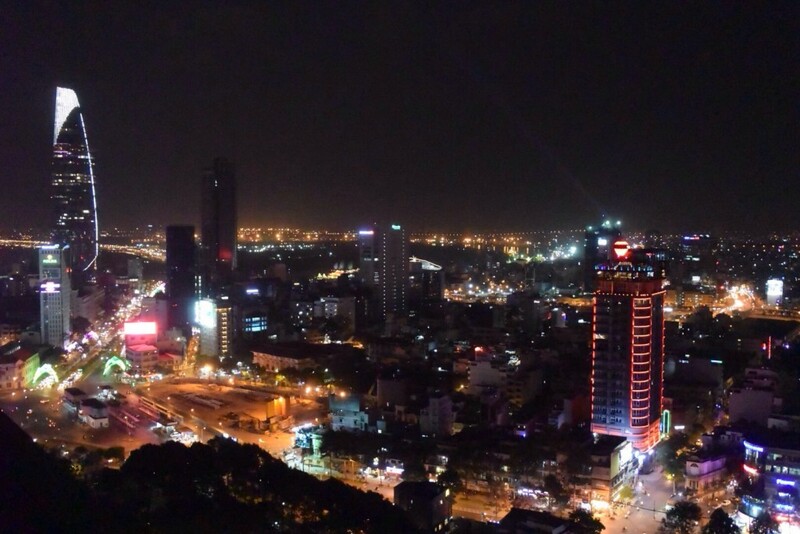 Ho Chi Minh City by night. An endless river of mopeds making its way through the city. 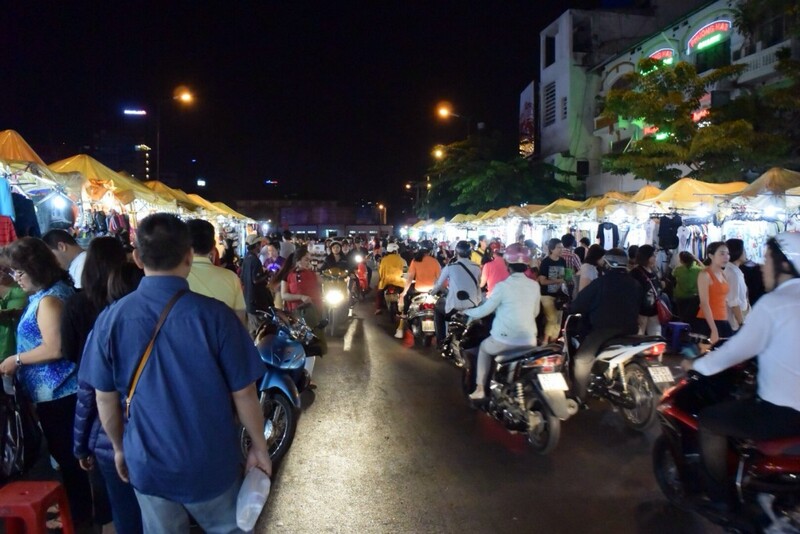 Mopeds making their way through the night market. Ho Chi Minh City, or Saigon as the locals still refer to it, is most definitely a city with a foot in both the old and the new. I think it’s going to be an interesting point of reference as we jump on our bikes and head out into rural Vietnam over the next few days. The first day of our adventure began bright and early at Heathrow, where we met our fellow cyclists inside Terminal 4. Several of us had met up on the briefing day back in November so it was great to see familiar faces again, but we were all easy to spot anyhow thanks to cycling helmets hanging from back packs! Sadly the group has shrunk a bit as a few people have succumbed to accidents and injuries over recent weeks. We’re still eleven strong though, and given the attrition rate we’ve all achieved something already just by making it to the start! Having checked in we made our way through security where, true to form, my hand luggage needed closer inspection after being X-rayed and flagged as “busy”. It seems the combination of electrical items together with pedals and a bicycle seat does look pretty suspicious. After a hearty breakfast of porridge with bananas, strawberries, and honey we headed off to the gate to board our flight to Kuala Lumpur.